Meandering Path to Self | love, music, (gluten-free) food and the whole world: a twenty-something's musings on the meandering path to herself. love, music, (gluten-free) food and the whole world: a twenty-something's musings on the meandering path to herself. Shauna, her husband and adorable daughter happened to be in New York City a few weekends ago, and organized a grand pot-luck in central park for the gluten-free folks of this island. Of course it happened to coincide with the most bizarre weekend I’ve had in a while (more on that later), nevertheless I trekked on down to the great lawn with baked goods in hand to meet this legendary woman. I decided to make cinnamon rolls. What I should have done, was go out and finish acquiring all my little bags of flour (it has turned into a slow and surprisingly expensive process), and use them in my ‘please-impress-Shauna-and-Danny’ creation. Unfortunately due to a lack of funds and time (again, insert bizarre weekend blame here), that was not an option. So I looked to my old stand-by shortcut cinnamon rolls and got to work. These call for Pamela’s Gluten-Free Bread Mix, which I’ve used before and always serves me well. This is really the only reason I deemed them a “shortcut” version… they actually take quite some time to prepare and require a little love and a lot of patience. They are, however, totally worth the effort. About meeting the Ahern’s: The potluck was extremely nerve-racking for me only because I am not the world’s best at new social interactions, and if all went according to plan: people who actually knew about food would be eating things that I made. Luckily, I fell into a situation where everyone was warm, inviting and happy to be sharing in the experience. Especially Shauna and Danny. I could not have imagined a more sincerely happy couple (having the cutest kid in the world didn’t hurt either). All I can say is that I am so glad that I went. About the bizarre weekend: I stumbled upon a ridiculously good job that I am incredibly unqualified for and was in the midst of training for that. I also managed to find my way to the San Gennaro festival in Little Italy, all while attempting to throw together applications for various apprentice programs. Quite different from the usual ‘dolce far niente’ style weekends that I have grown to love. So here’s how to make them for whatever kind of weekend you’re in for. If you scroll down a bit there’s a big ol’ picture of the cinnamon rolls themselves! Ooo that one did give me a jolt. Spray the inside of another bowl with non-stick cooking spray and transfer the dough into the new bowl. Spray the top of the dough with non-stick cooking spray, cover and allow to rise for at least and hour (two would be better…). Lay out two long sheets of parchment paper and spray with non-stick cooking spray. Place the dough onto one of them, and the other (spray side down) on top. 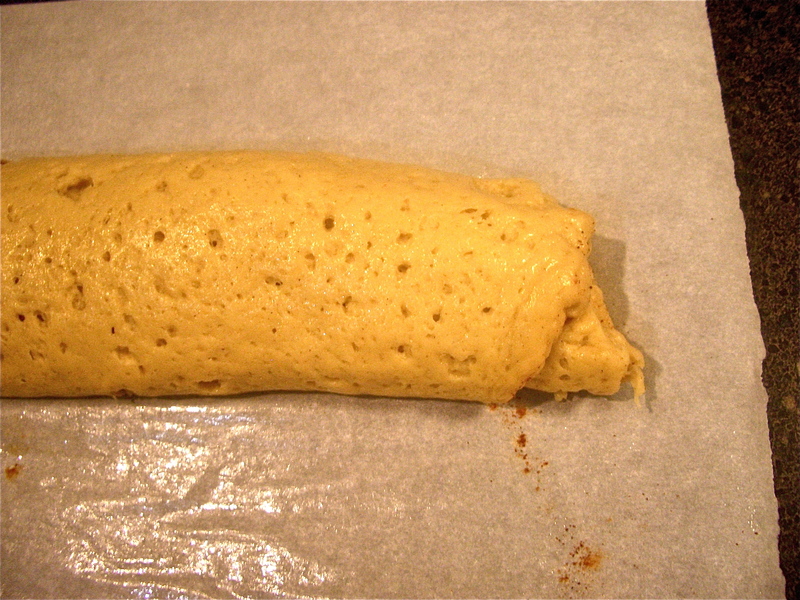 Use a rolling pin (or your hands) to roll the dough out into a long even rectangle, checking every once in a while to make sure the dough isn’t sticking. 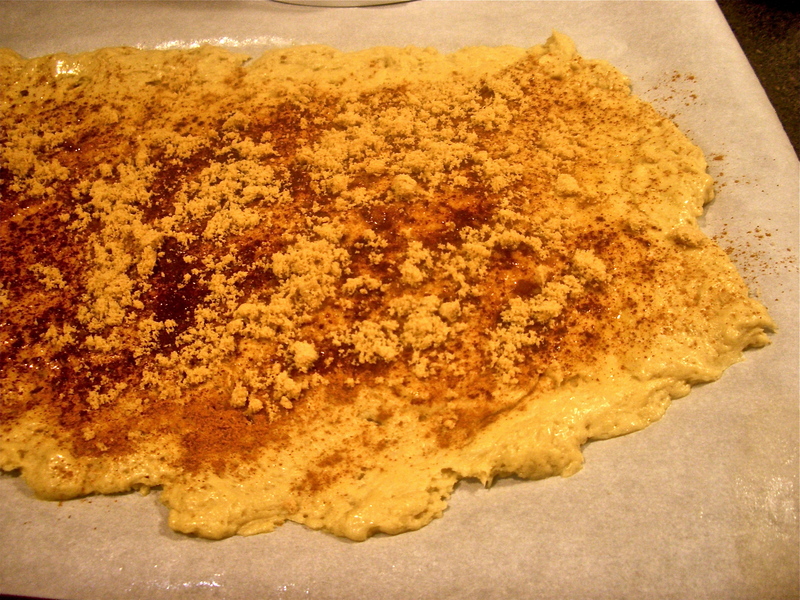 Cover the dough liberally and evenly with melted butter, cinnamon and brown sugar (leaving a small edge plain on one long side to create a bit of a seal when rolled up). 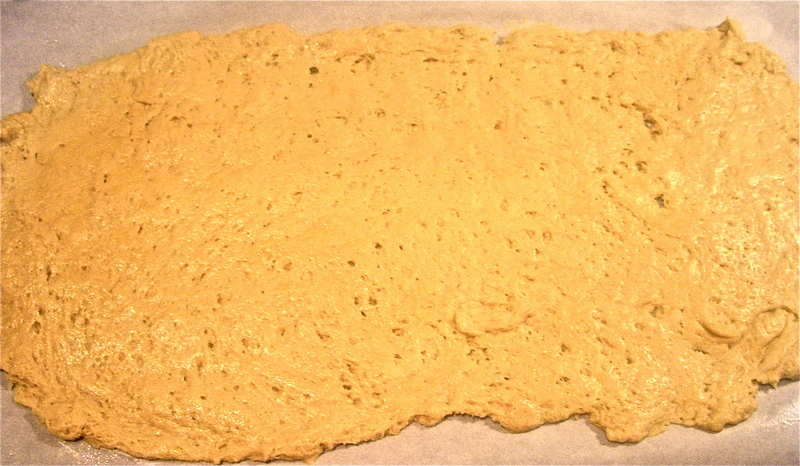 Line a deep rectangular baking dish with more parchment paper and spray it as well. Cut the roll into eight even pieces (it helps to start by cutting the whole thing in half, then the halfs in half, etc. etc. ), and place spiral side down in the baking dish. Cover and place in the refrigerator overnight. 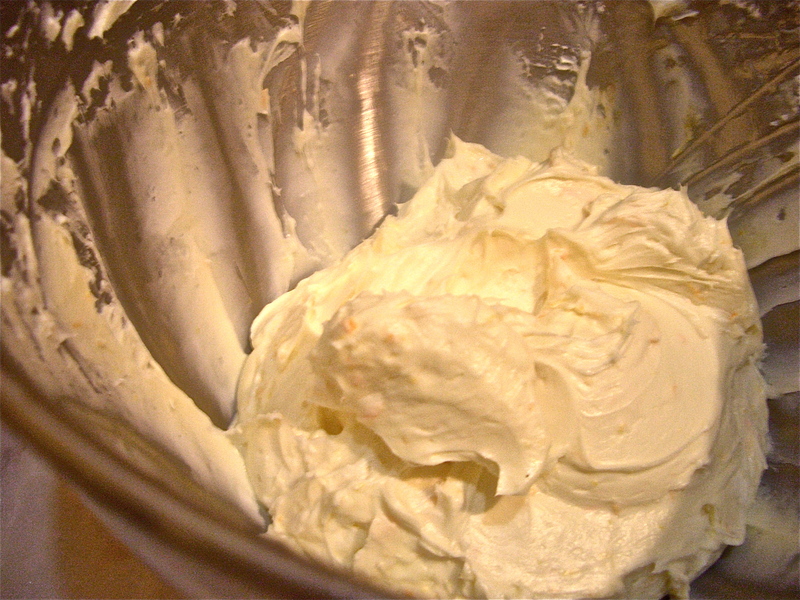 With the mixer, in a separate bowl, cream together the room temperature butter and cream cheese. 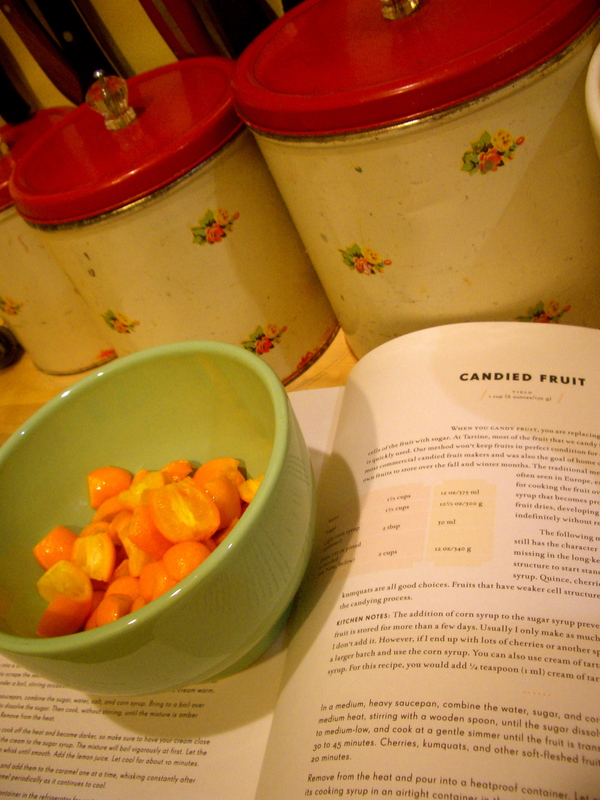 Add the confectioner’s sugar to taste (I like mine a little less sweet than most), and the vanilla and orange zest. Set aside. 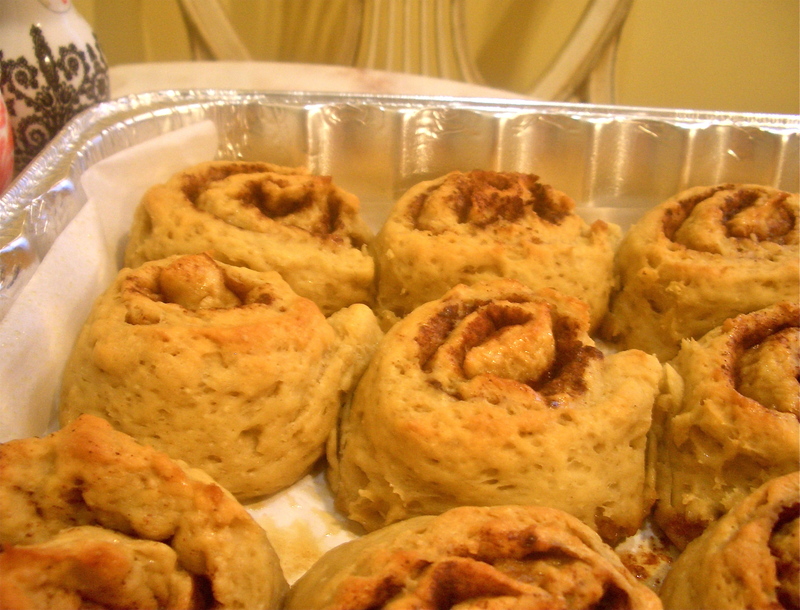 Bake the cinnamon rolls at 350 degrees fahrenheit for about 45 minutes or until golden brown. 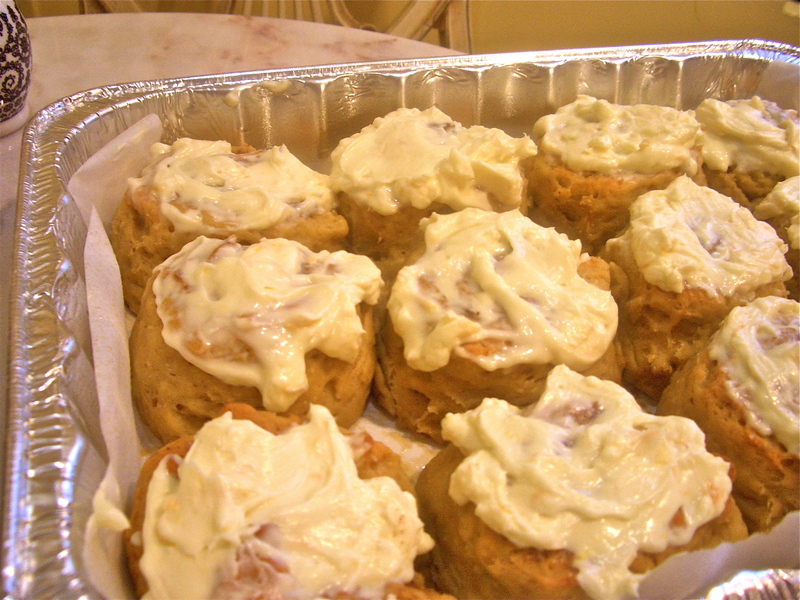 Frost while they’re still warm so that the frosting melts into all the little nooks and crannies. Your house will smell good, your soul will feel good, your taste-buds will be happy and all will be well. Things are picking up speed around here just as expected. September has FLOWN by and deadlines are hurtling towards me at breakneck speeds. It’s getting to the point where dinners for the week are made on Sunday so that there’s one less thing to worry about on weekday evenings. These are the days I have to take one baby step at a time and try to keep my down so as not to panic at the sight of the many things I have yet to accomplish. In an attempt to slow down I decided that I absolutely needed macaroni and cheese. Preheat the oven to 375 degrees Fahrenheit and cook the pasta according to package directions, remembering to stop cooking 2-3 minutes before the pasta is cooked through (it will finish in the oven). In the meantime, heat the milk over low heat in a small saucepan. In a second saucepan, melt the butter over medium heat. 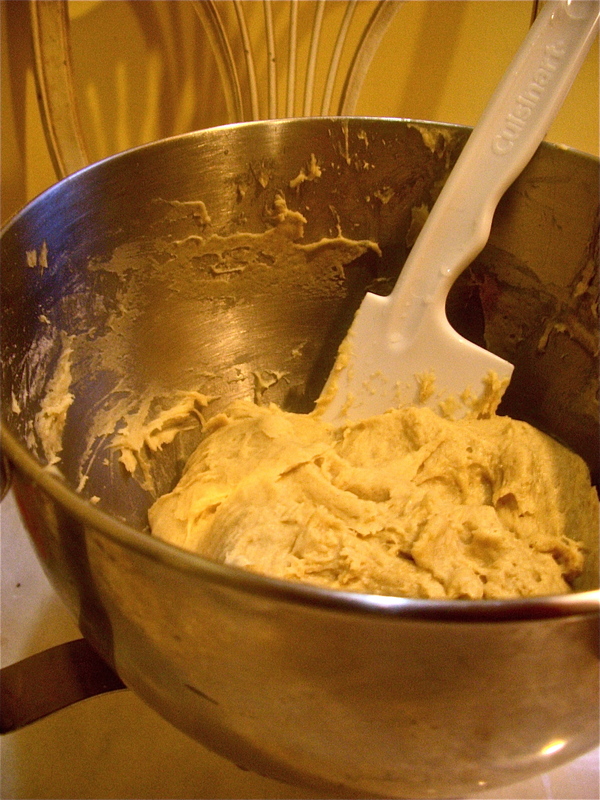 Add the flours to the butter and allow to cook for 3-4 minutes stirring constantly with a wooden spoon. Add the milk and continue to stir until the sauce begins to thicken. 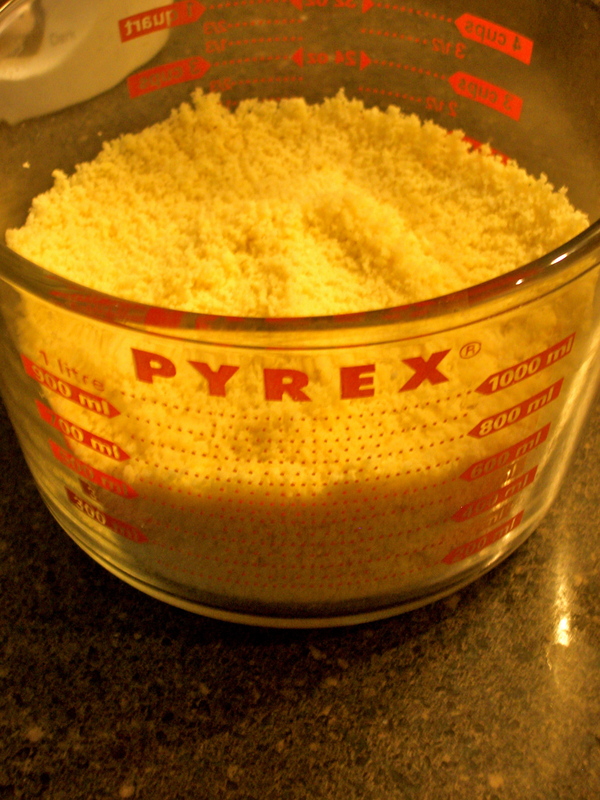 Remove the saucepan from the heat and add the grated cheese, reserving 1 1/2 tablespoons of each to add to the breadcrumbs later on. Add the pasta to the sauce and salt and pepper to taste, and pour into a baking dish (I used a 9 inch pie dish… macaroni and cheese pie anyone?). 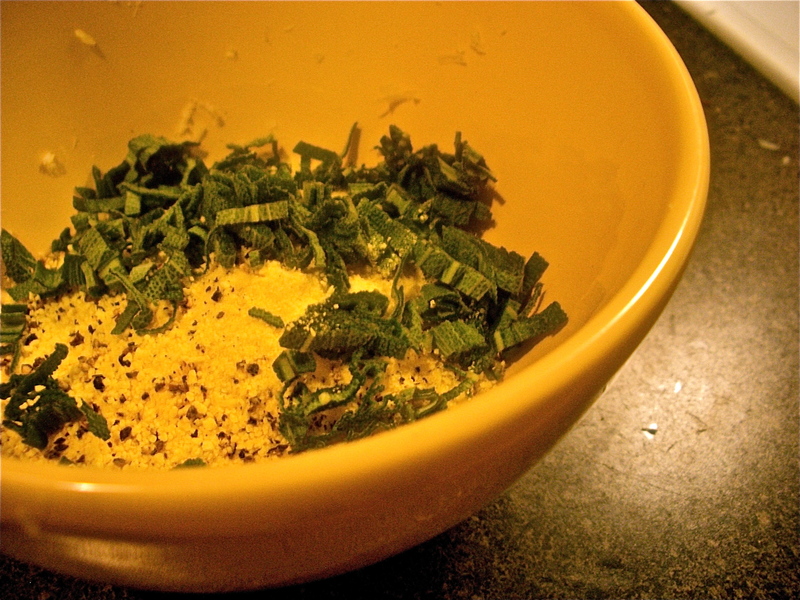 Combine the chopped herbs, breadcrumbs, leftover cheese, salt and pepper and sprinkle over the pasta. Slice the tomatoes and layer them on top, sprinkling them with a little more salt. 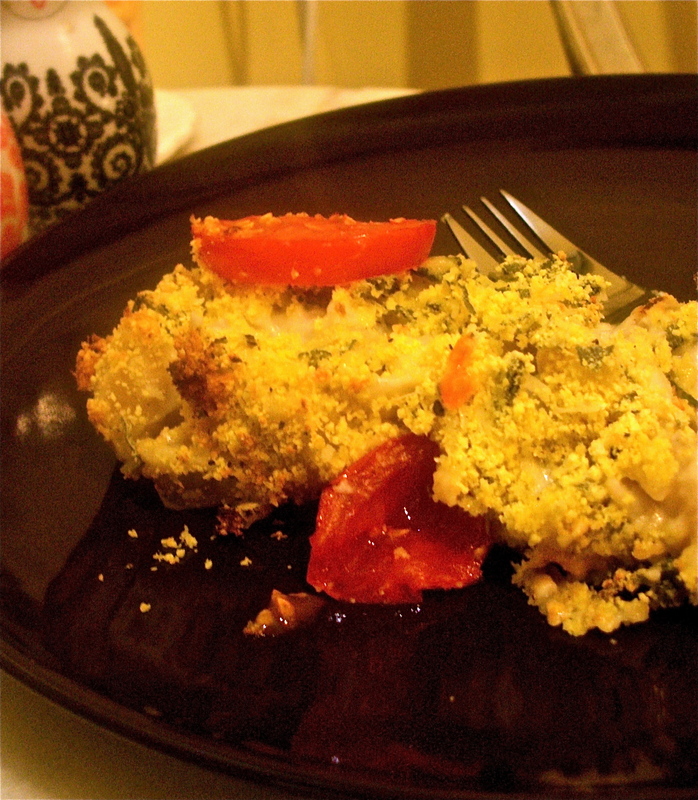 Bake for 20-25 minutes or until the sauce is bubbly and the crust is golden-brown. 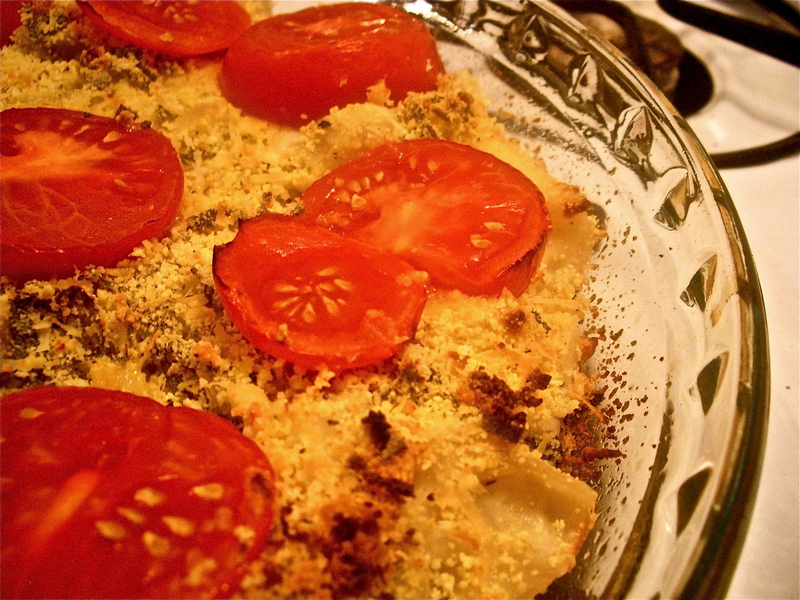 This will definitely satiate any craving for cheesy pasta. After a long and cleansing vacation, in a new headspace and with a new attitude, I have returned. 1. My parents’ home: I spent three whole months with MY PEOPLE. Sometimes living in this big, noisy, crowded city allows for the idea to creep in that you don’t have people. Tricksy little city. While with my parents I climbed big mountains, cooked a lot of things that I didn’t take a SINGLE picture of (whoops) and calmed down. By the end my pulse was probably dangerously low and I loved it. 2. I also went to Tampa, FL for some school related soul searching. I have to admit that Tampa is not my favorite place in the world to be, but I certainly got what I needed from it. So! Here we are. Clinging to the last days of summer and succumbing to the cool breezes of the beautiful fall. I must say that September in Manhattan is unlike any September I’ve experienced. Perfect weather, turning leaves and the excitement for the coming holidays look lovely on this city. 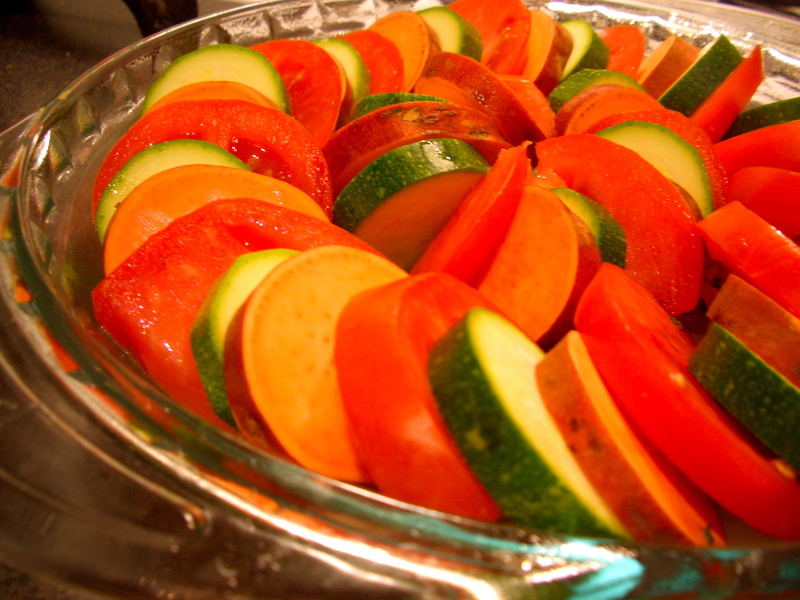 In the spirit of hanging on to these final warm and sunny days, and for my dear friend Catherine, I adapted Ina Garten’s Vegetable Tian. 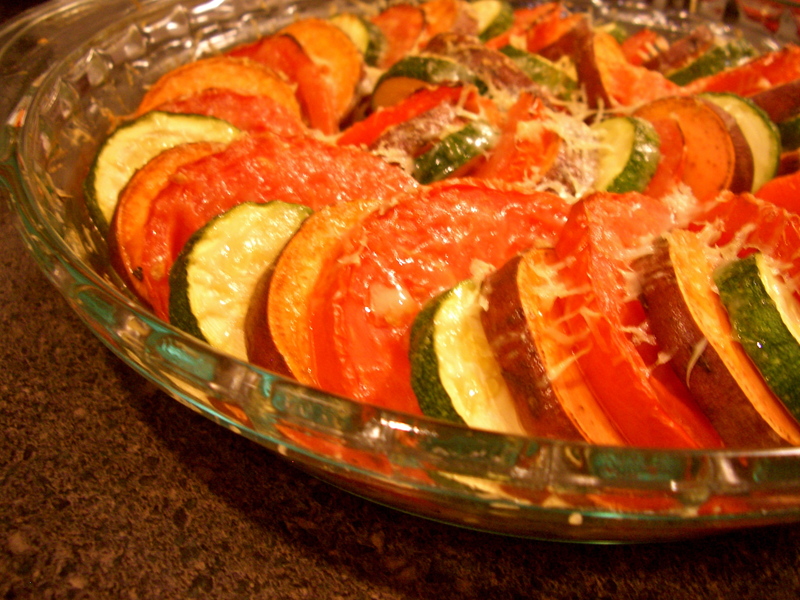 A better idea, in my humble opinion, than a thankless ratatouille, and an occasion to give those summer vegetables a final chance in the spotlight. Swapping potatoes for sweet ones and thyme for sage makes this a bit more well-suited for September days, and a good helping of Gruyere sends it over the top. Preheat the oven to 375 degrees Fahrenheit and spray a 9-inch pie pan with nonstick cooking spray. 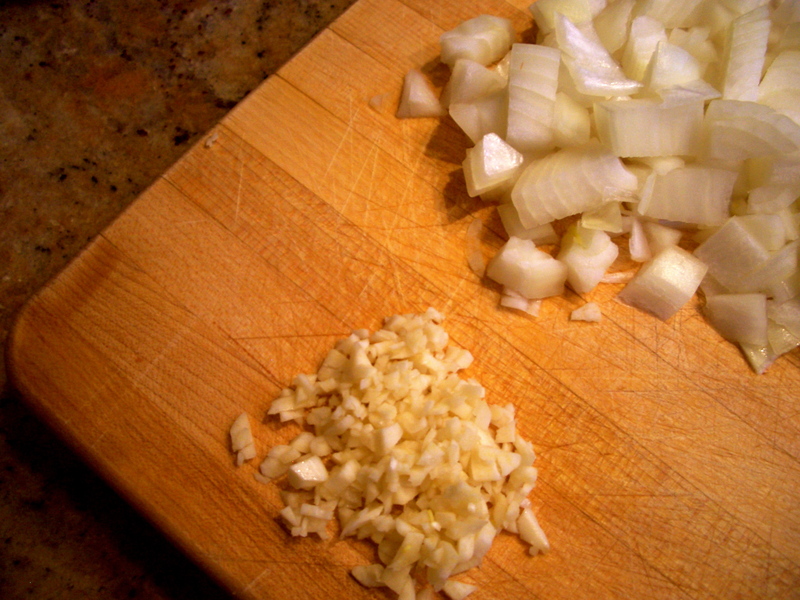 Slice the onions and saute over low heat with two tablespoons of olive oil, until translucent (6-8 minutes). 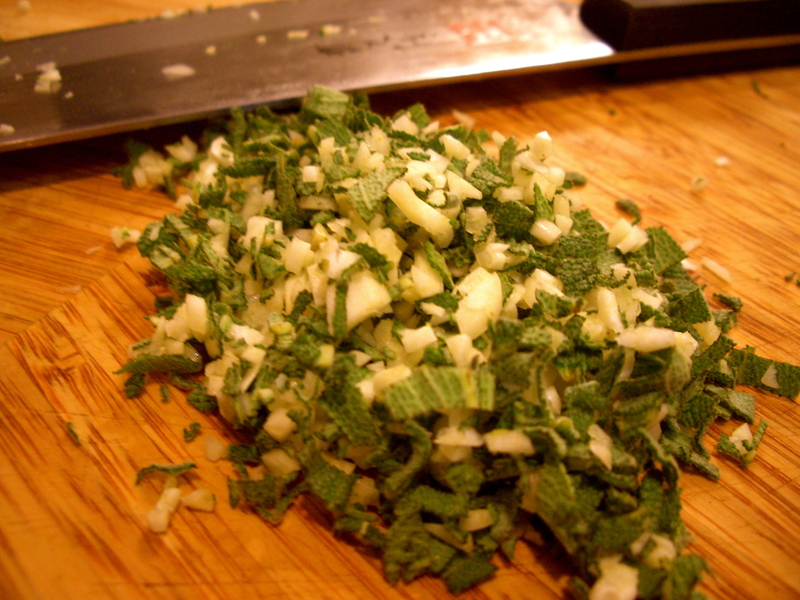 In the meantime, mince the garlic and the sage leaves together to create a cohesive mixture and add to the pan. Add one tablespoon of butter and cook for about one minute more. Put the onion mixture on the bottom of the greased pie pan. 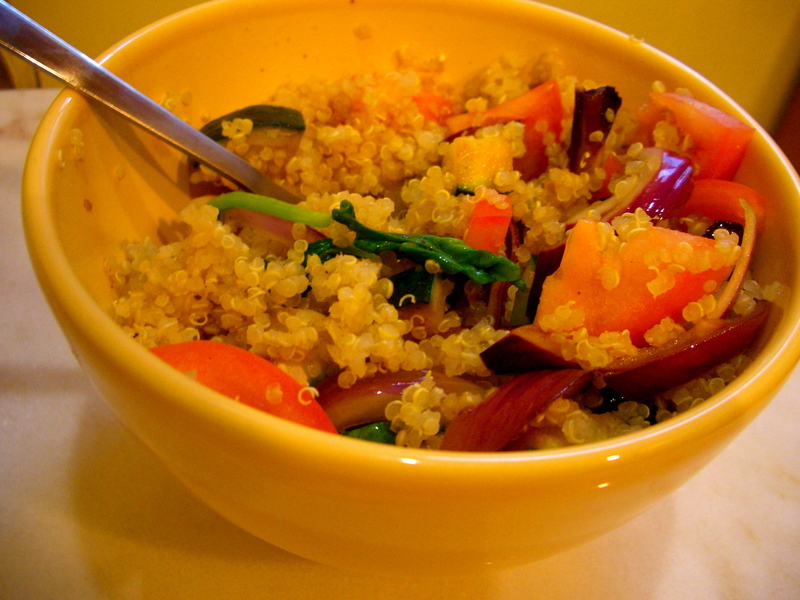 Slice all of the vegetables into even 1/4 inch thick slices and arrange them alternately in the pan on top of the onion. Drizzle one more tablespoon of olive oil over top and add salt and pepper to taste. 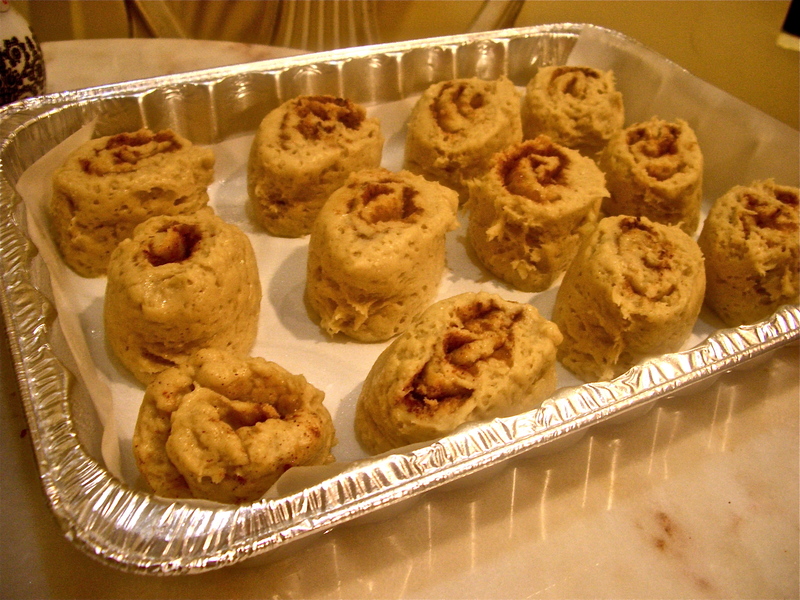 Cover with aluminum foil and bake for 35 minutes. 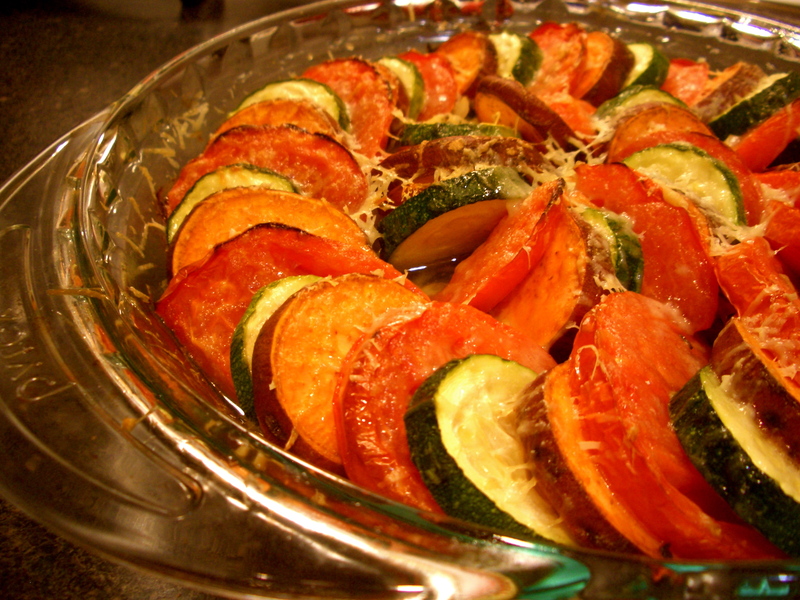 Remove from the oven, uncover the vegetables and sprinkle the gruyere over them. Bake for another 30 minutes or until browned. Cheers to a warm September belly! I’ve finally slowed down: Fallen into rhythm with the untroubled pace of life that is such a vital part of my New Mexico experience. My focus has drifted from worrying about future plans, to focusing on the enjoyment of leisurely dinners in the patio. From quickly and anxiously getting from place to place, to deciding how a turtle managed to get onto the bike path I’m cruising down. My heart rate has slowed, I’m breathing from my belly, and sleeping like the dead. This week I was challenged to practice Mindfulness. To experience each minute task fully, and to reside in the present. Sounds simple enough, right? Wrong. Dead wrong. I find that my mind stubbornly wanders, even when engaged in complex or short-lived activities. I’ve spent far too much time in the yesterday and tomorrow, and escorting my brain back to the right now is proving to be more problematic than I anticipated. When it happens though, oh when it happens: every undertaking turns into something compelling. Even something as mundane as chopping vegetables takes on a new importance. Feeling the resistance of the onion under my knife, falling into a steady rhythm with my hands, noticing the stark contrast between the white of the onion and the dark cutting board, and smelling the burst of fragrance after each cut: all these become the only relevant factors of that moment. If only I could stay there for more than a few seconds. This week I also received a small gift! 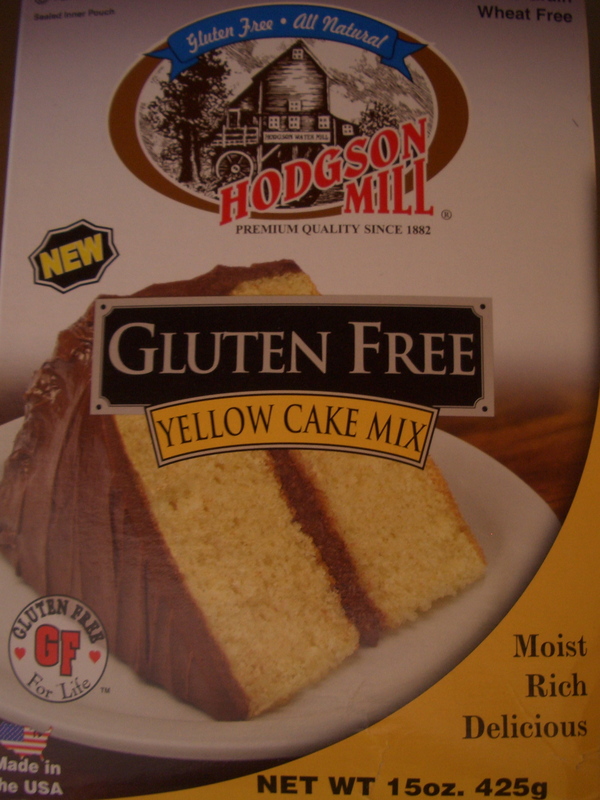 Someone sent me a box of Hodgson Mill gluten-free cake mix to try. I must say, in a pinch, it is a wonderful thing. 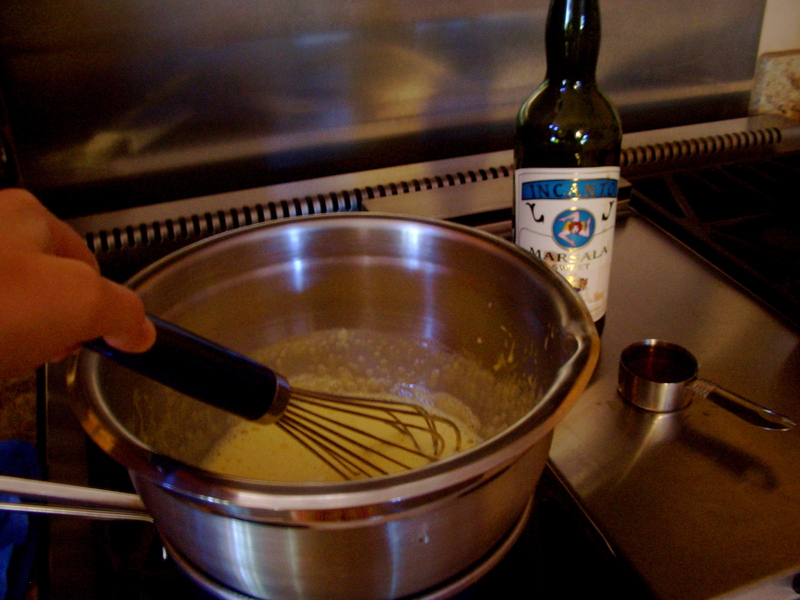 Zabaglione. Of all of the creamy custards, this might be my favorite. 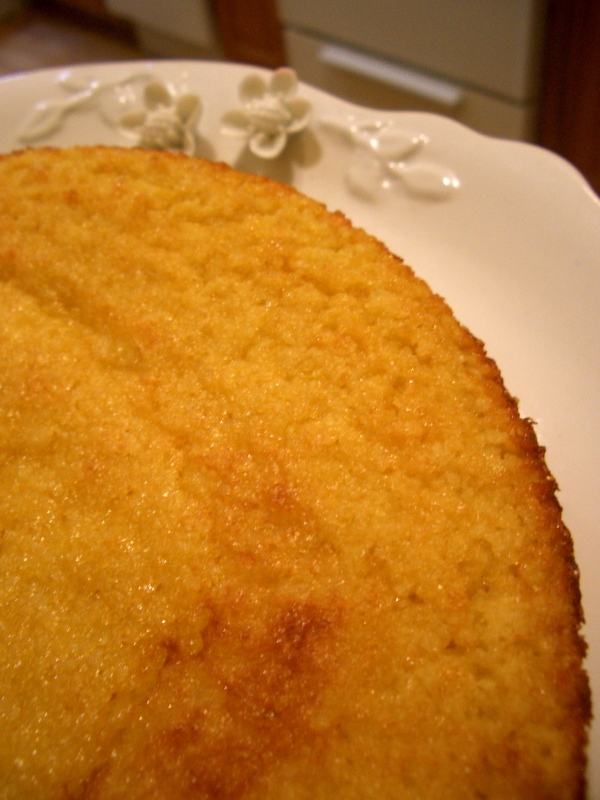 Rich, thick and a little alcoholic: it’s perfect with fruit, in a cake, or standing alone. Eat it slowly and eat it with all five senses. It’ll be over all too quickly anyway. Bring a saucepan of water to a boil then reduce to a simmer. 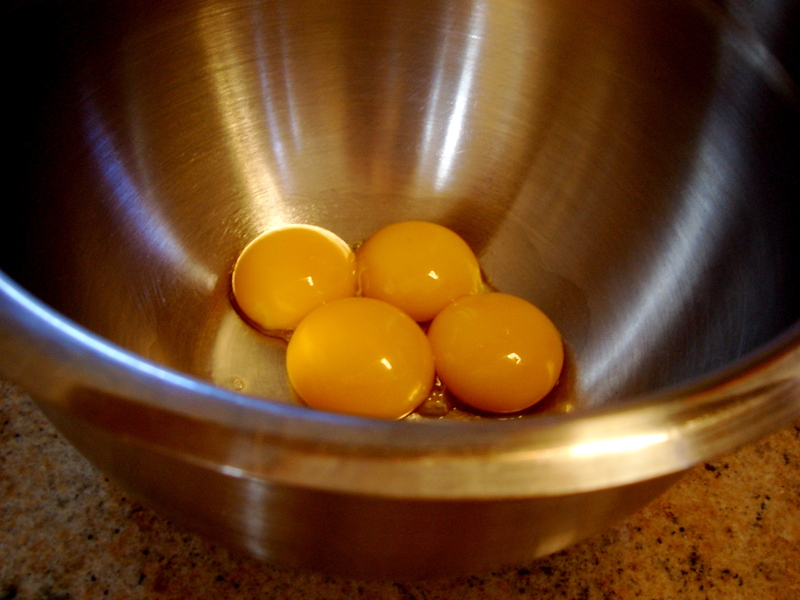 In the meantime, in a large metal bowl, beat the egg yolks with the sugar until they thicken and turn a pale yellow. Place the bowl over the simmering water and whisk continuously, making sure to scrape any of the mixture off of the side of the bowl. 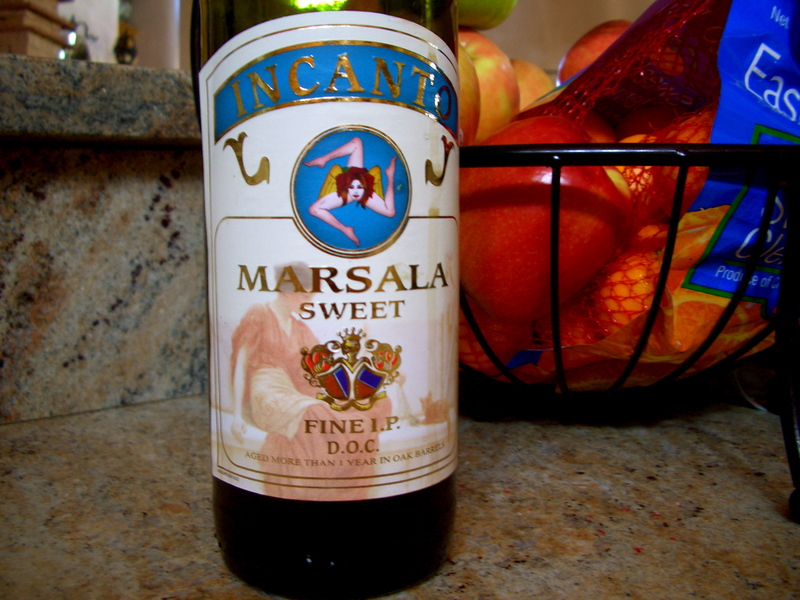 As you beat the mixture slowly pour in the Marsala wine. 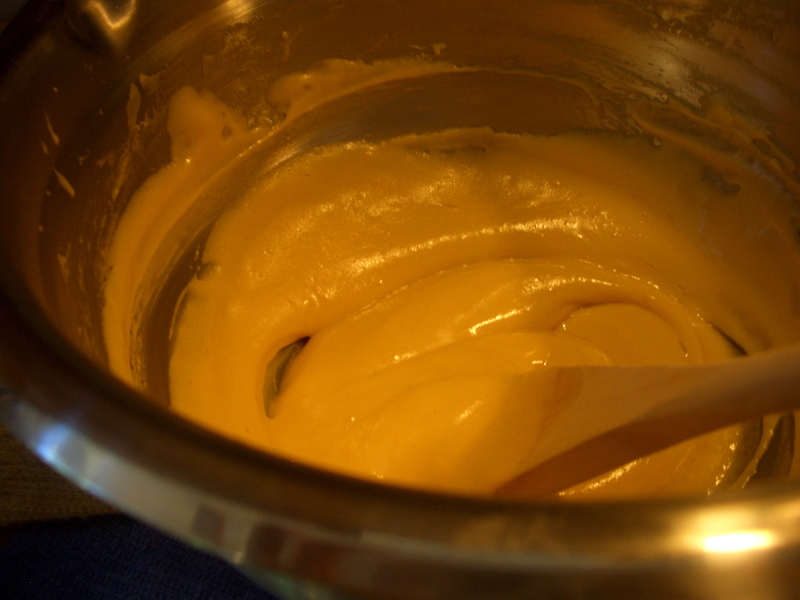 Continue whisking until the mixture is thick and custard-like (about 10 to 15 minutes). Serve warm, room-temperature or cold. Alone, over berries or in a cake! Slow down and participate in the right now. 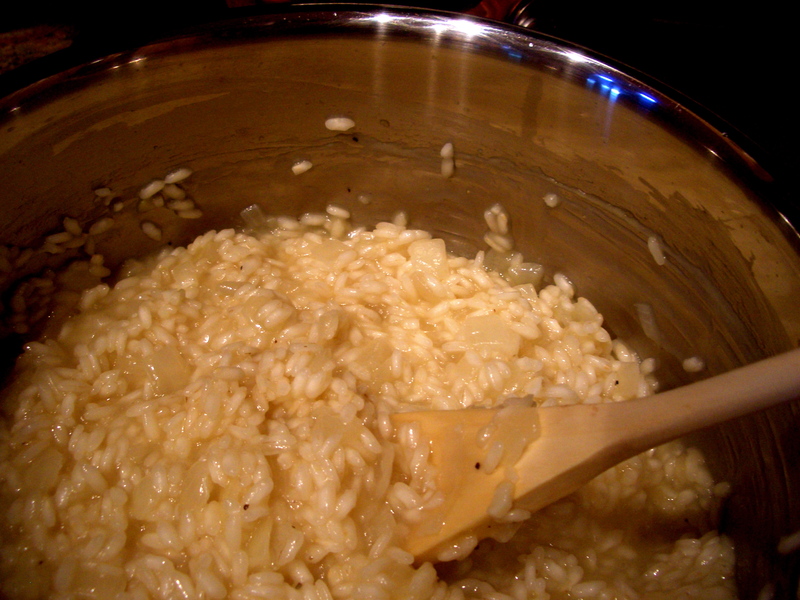 Risotto is a labor of love. 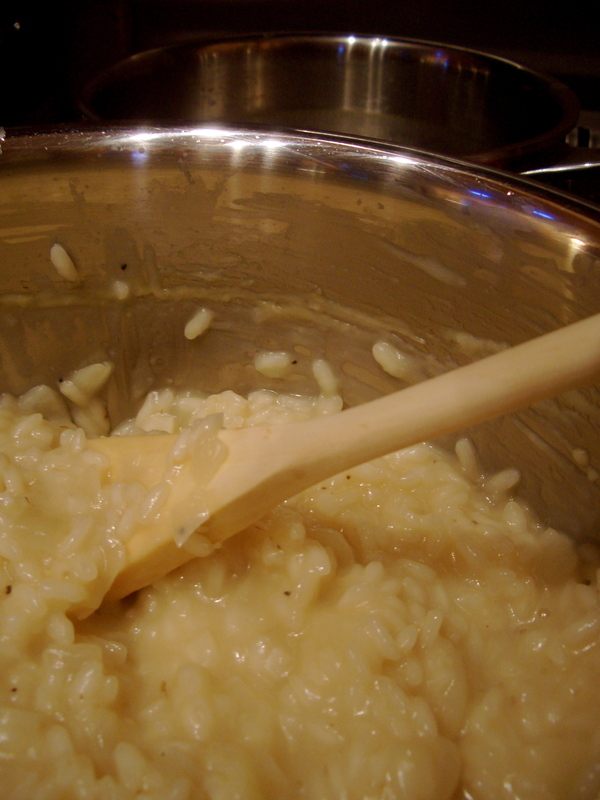 Although the concept of risotto is a simple one, it’s definitely not a quick fix. You’re going to need a bit of patience and a strong stirring arm for this one. It is, to me, the perfect example of combination of menial tasks coming together to create a gloriously epic dish. In preparation it is a oddly satisfying, cathartic experience; and upon ingesting it will satiate a hunger you didn’t even know you had… I think I might need a risotto intervention. Since my first experience with this creamy delight, I’ve attempted to experiment with as many variations on the basic idea as I could find. Notable examples: butternut squash and sage risotto, lemon asparagus risotto, red wine risotto with pancetta, saffron risotto, even desert risotto. The possibilities are limitless and the people you share with will be singing your praises. What could be better? 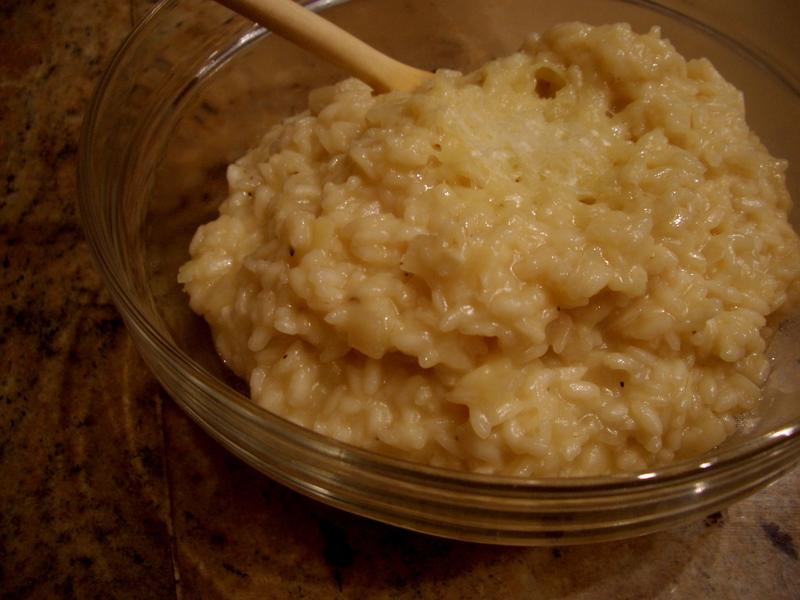 This recipe is adapted from the Saveur Cooks: Authentic Italian collection of risotto recipes. Bring the chicken or vegetable stock to a boil in a saucepan, and reduce to a simmer. 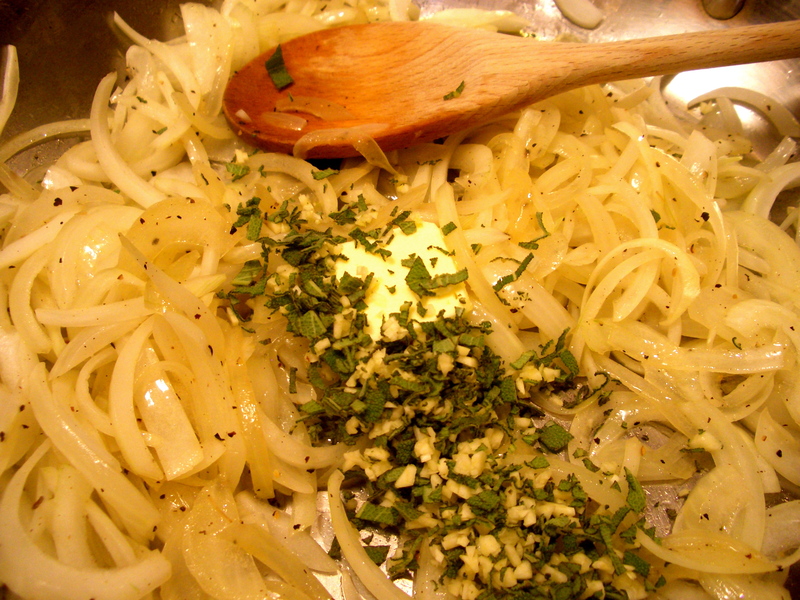 In a larger pot melt the butter or heat the olive oil, and add the onions. 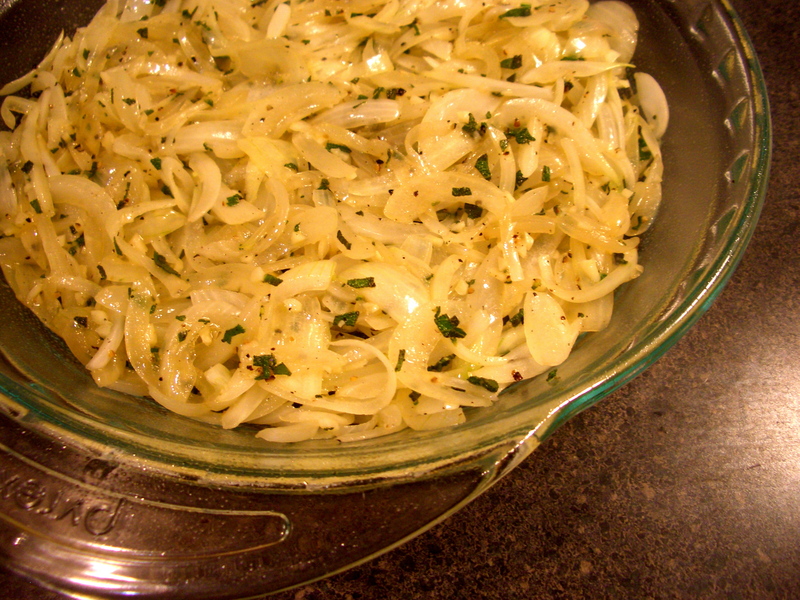 Sauté over medium heat for 5-6 minutes to sweat the onions until they are transparent. Add the garlic and continue to cook for one more minute. 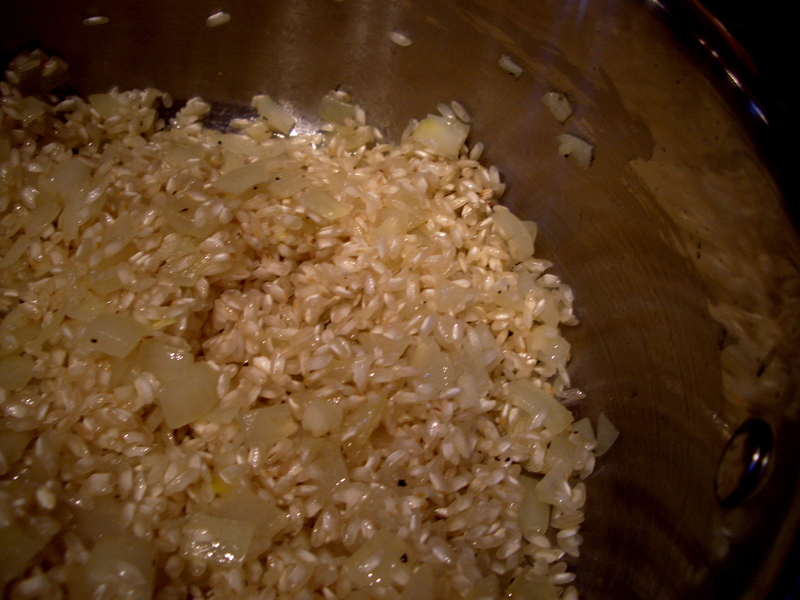 Add the arborio rice and stir to combine with the onions and garlic to toast the rice. 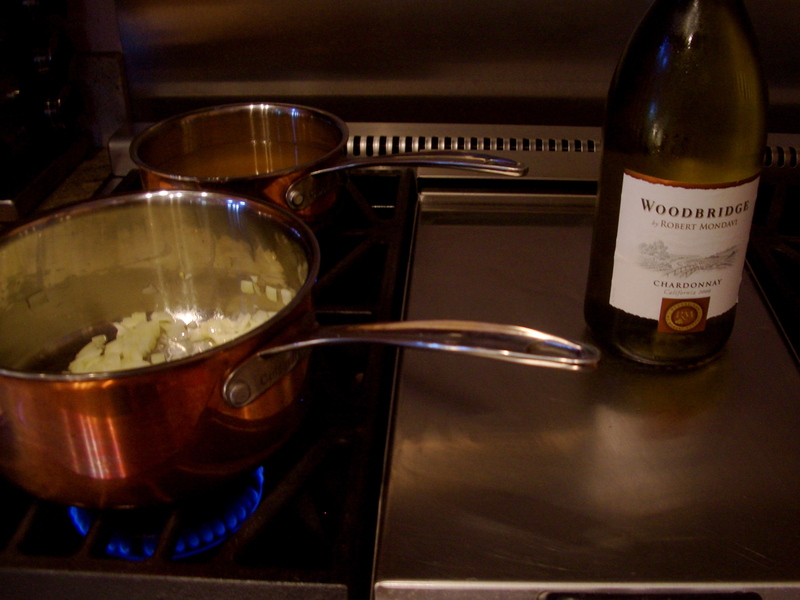 Add the white wine and stir continuously until the wine has evaporated. Add about one half-cup (it’s easiest to use a ladle for this) of the stock to the rice and stir continuously until the stock has evaporated. Add salt and pepper to taste. Continue adding one half-cup of stock at a time, stirring all the while and allowing the stock to evaporate, until all of the stock has been used. The rice will become creamier and creamier in consistency and when it is done it will have a thick, almost pudding-like consistency. Taste the rice to make sure it is cooked through (if it isn’t just keep adding a little hot water and stirring to evaporate, as you did with the stock, until the rice is cooked). 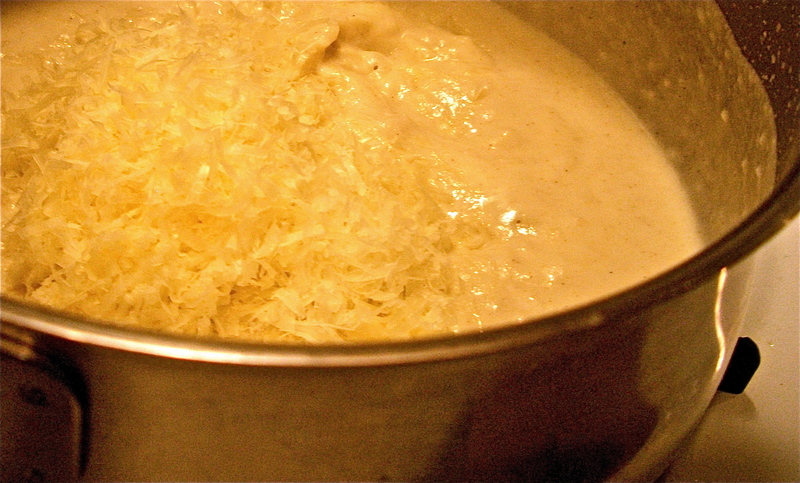 Turn off the heat and add the parmigiano-reggiano, stirring to combine. Make this for someone you love. Make it for someone you hate. Make it for yourself. Make it for me! My long-awaited vacation is fast approaching, and I am becoming more intoxicated and consumed by the thought of spending some time at my parents’ home by the second. When I was in high school I was a violinist. I played in every orchestra I could get my little hands into, and loved it. Every conductor brought something different to the experience, be it bad or good. One of the memorably good ones happened to be a guest conductor from New York, who had come to conduct our all-state symphony. He stood up on the podium for the first time and the orchestra fell silent: we expected a fast-talking, no frill approach to his method. Instead we got a long sigh, a deep breath and instructions to relax a minute. He told us that he was relieved and happy to be conducting in New Mexico for a change. This set off a wave of raised eyebrows throughout the sections. Did he remember where he got to live?! He was happier in Albuquerque than in New York City?! He perceived our disbelief immediately and clarified. He said that Manhattan was a fantastic, exciting city that was exploding with opportunities. Being in New Mexico though? 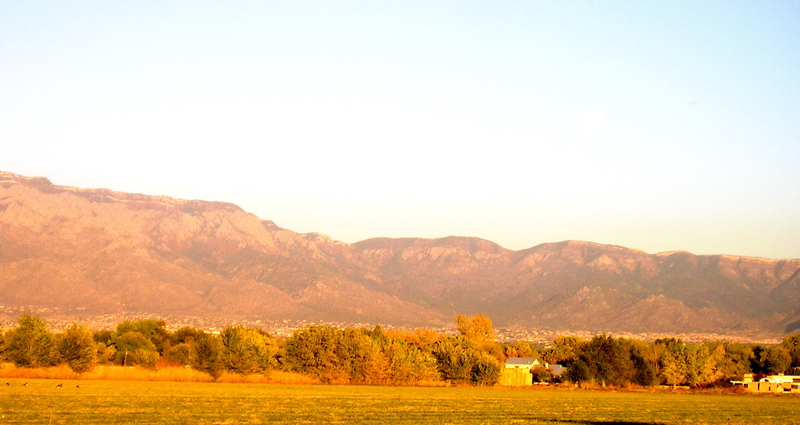 Being in New Mexico inspired deep breaths, and long sighs of relief. It gave you room to relax, and let you see all the way to the horizon. He couldn’t get enough of that feeling. Now I’m itching for it too. 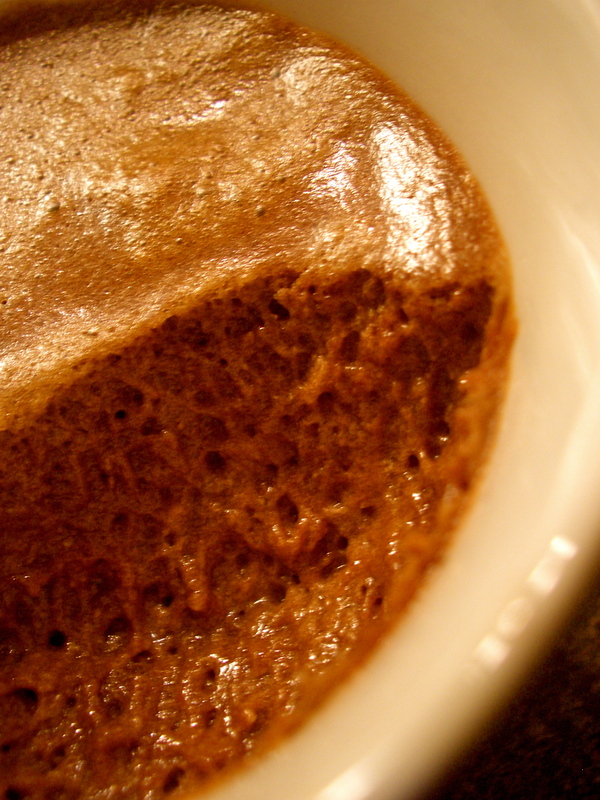 Over a pot of simmering water, melt together the chocolate, butter and coffee until smooth. Fill a large bowl with ice and water and set aside. 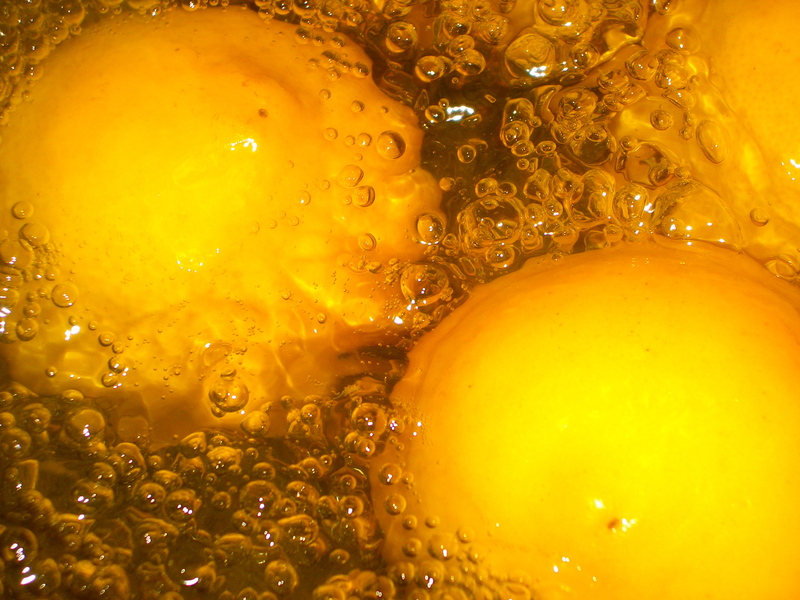 Place the bowl with the whisked egg yolks into the bowl of ice-water and continue whisking until it is cool and thick. Then fold the chocolate mixture into the egg yolks. In a large bowl, beat (the handheld mixer comes in handy here too) the egg whites with the salt until frothy (Also, if the raw egg white part makes you uncomfortable you can beat them over the bowl of simmering water for a couple of minutes). Continue to beat until they begin to hold their shape and add the remaining tablespoon of sugar and the vanilla. 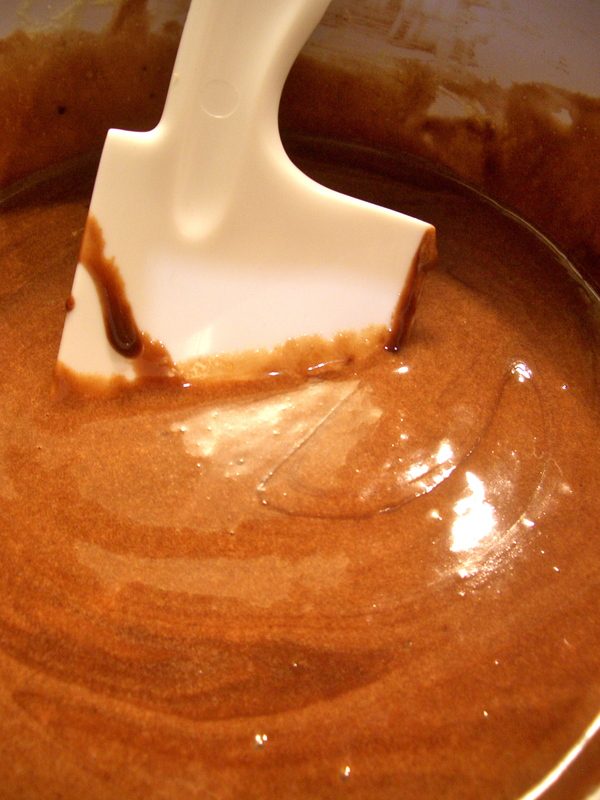 Beat until the mixture is thick and shiny, but doesn’t hold stiff peaks. 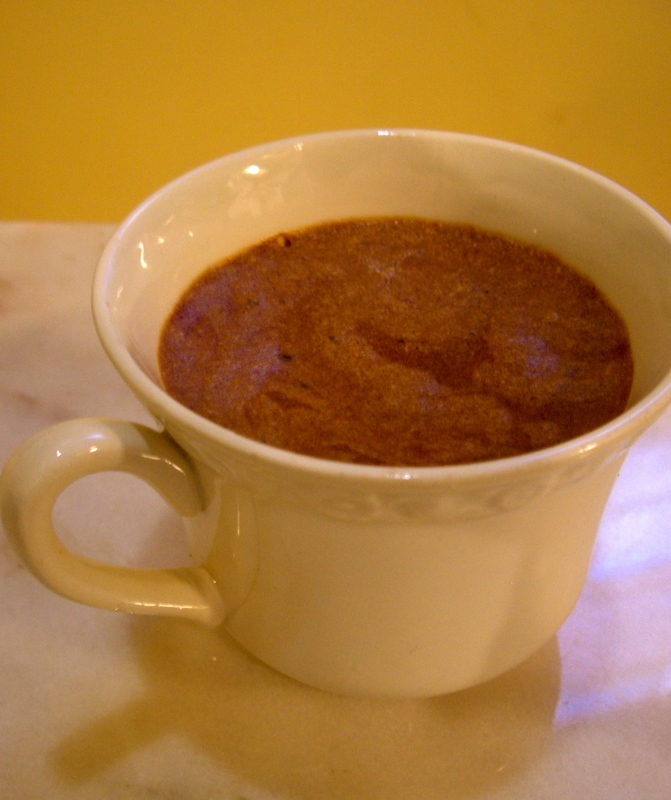 Fold one third of the beaten egg whites into the chocolate mixture to combine, then fold the chocolate, egg-white mixture back into the remaining egg whites until it is incorporated. 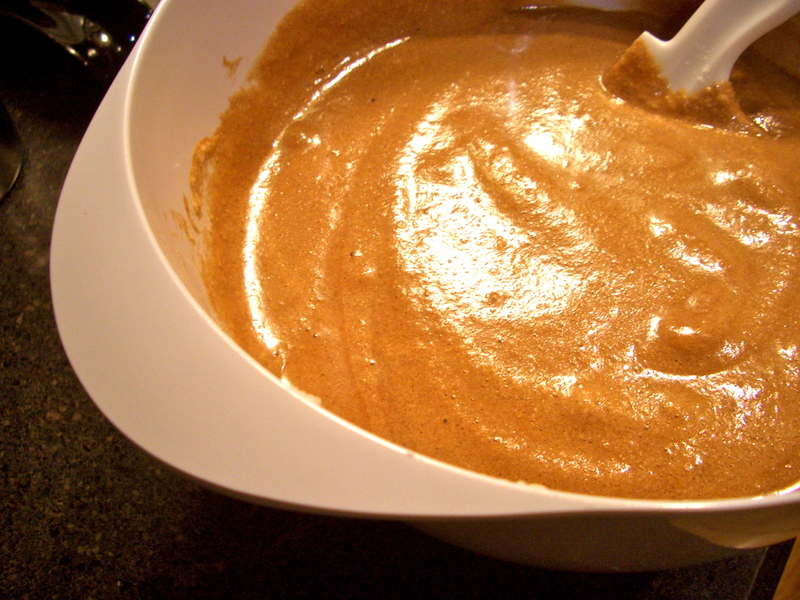 Transfer the mixture into whatever dishes you would like to serve the mousse in and place in the refrigerator for at least four hours, or until firm. 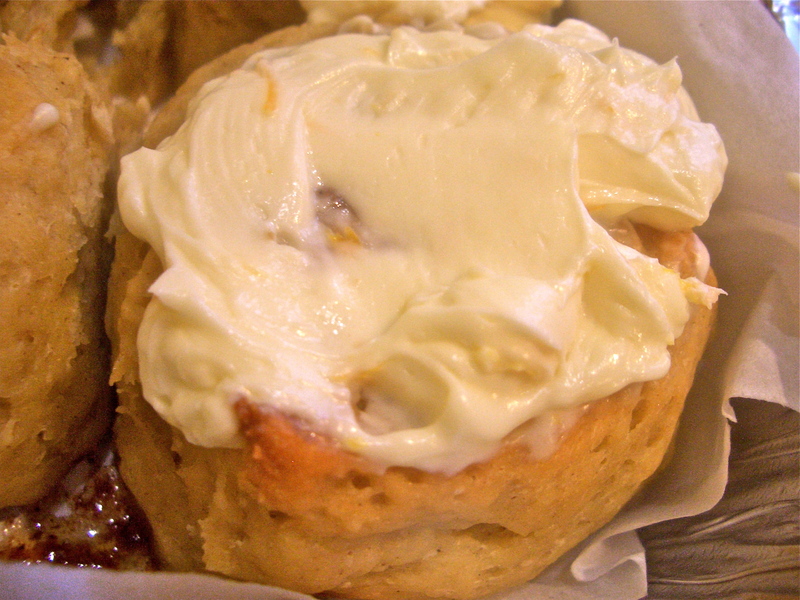 Serve by itself or with fresh whipped cream! The notion of wonder has been floating around in my brain for a couple days now. Someone brought it up to me recently, and I can’t help but feel like it is something that we have collectively stamped out of our culture after people reach the age of eight or nine. Wonder. We’ve changed it: turned it into white bread, into a question. Well, I want it back. My most recent wonder-filled days happened three years ago in a tiny town in Italy. Everything was inspired: choosing clips to hang clean laundry out of my little window, watching a fly buzz around my cup of coffee in the middle of the afternoon after a long nap, listening to the old men of the town enthusiastically playing their daily game of cards. It was a paradox. Insignificant events became remarkable, and I paid attention. Every time I come back from Italy I convince myself that I will carry that simplicity and love for life into the life I lead here. Every time those ideas fall to the wayside within weeks of jumping back into a full and hectic schedule. This time I have not just returned from Italy, but I am looking to shift my awareness. Let’s hope it lasts for more than a week. One place I never have to work hard to find wonder in, is in berries. I could eat buckets of berries: by themselves, with fresh whipped cream, in salads, in desserts. Anytime. Always. Look at them! They’re truly remarkable little buggers. What could be more inspirational in my quest for wonder than a pile of those, bubbling under a buttery, sugary crust? Nothing. Preheat the oven to 375 degrees. 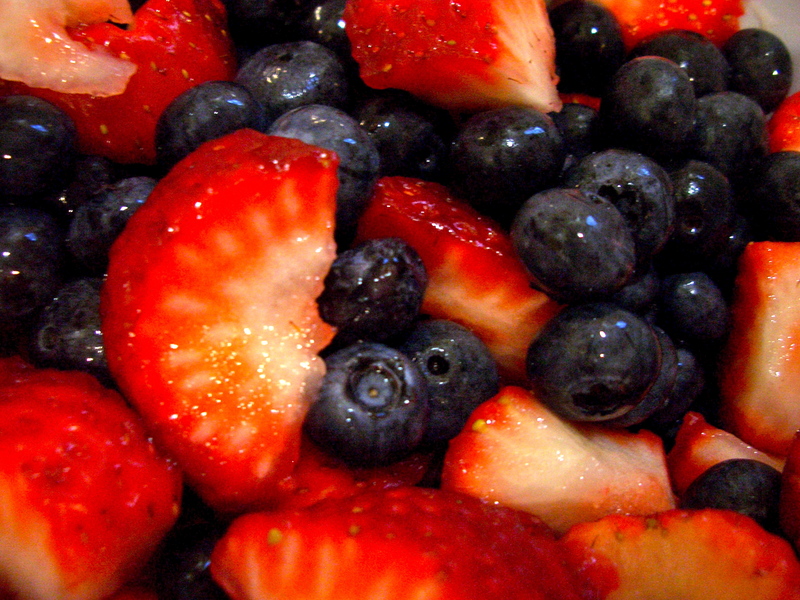 Combine the blueberries, strawberries, lemon juice, zest and vanilla in a large bowl. Add the cornstarch and integrate until the mixture becomes a little pasty. Add the sugar to combine. 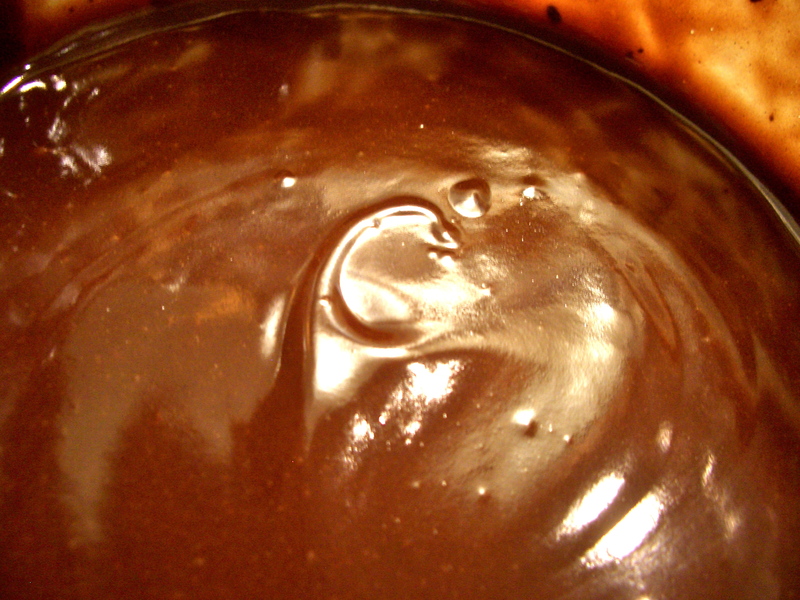 Grease a 9-inch pie dish or a casserole dish and pour in the filling. Bake for about 30 minutes or until the fruit is tender and the juices begin to run. While the fruit is in the oven, combine the flour blend, cornmeal, baking soda and salt in a bowl and fluff with a fork. Add the light brown sugar and stir to combine. Cut the frozen butter into small pieces and using a food processor or a pastry cutter, integrate into the flour mixture until pea-sized crumbles form. Put the mixture back into the freezer until ready to use. 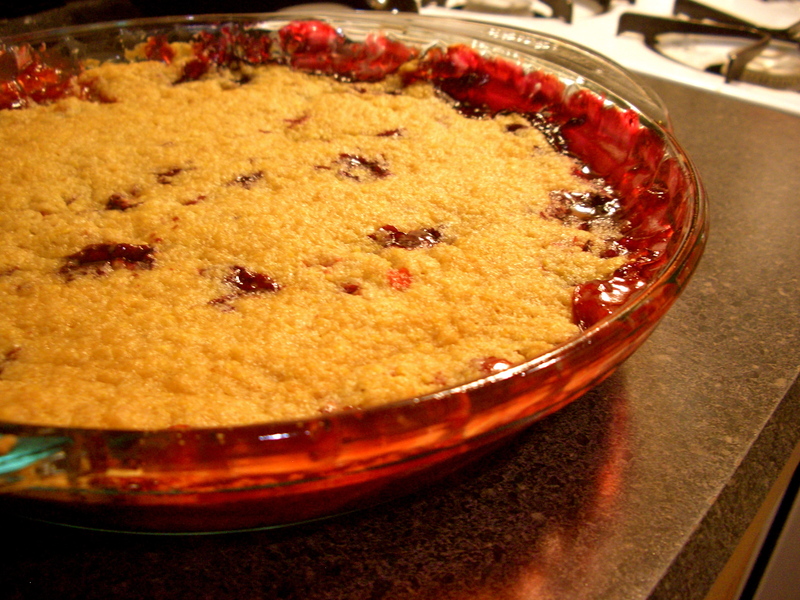 Remove the berries from the oven and spread a layer of the crumble topping over them to cover. 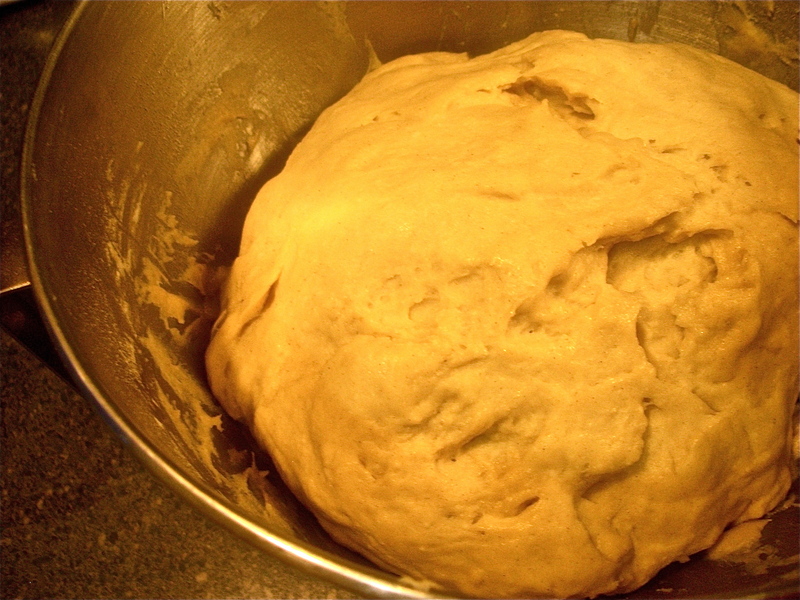 Bake for approximately fifteen more minutes or until the crust begins to brown and the fruit is bubbling nicely. 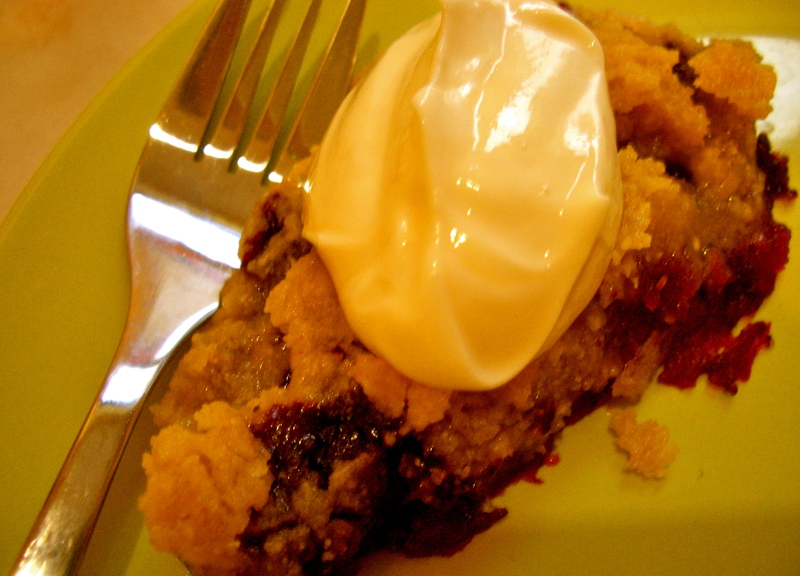 Allow the crumble to cool and serve with whipped cream. Or whipped, sweetened yoghurt. Or ice cream! 1. My parents are remarkable people that anyone should be so lucky to spend time with. 2. My parents being here automatically alleviates the constant feeling of panic this city inspires in me. 3. My parents being here marks the last very busy and long week for a long time: After this week come three hassle free weeks in Manhattan, followed by an entire summer at my parents’ house. I could not be more delighted. The visit lasted an entire week long, and was filled with the following: free ingredients for as many recipes as I could muster, the dragging of feet through the 5th and 6th hour of museum going, long dinners with big glasses of red wine, and the occasional bit of nagging. 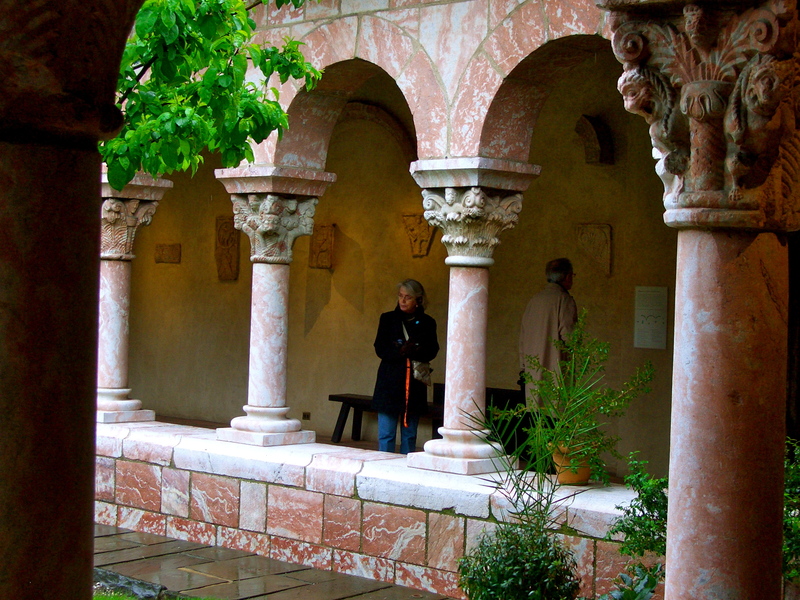 Of course it rained on Cloister day. The weather and I seem to have a bad relationship. It seems like the older I get, the harder it becomes to say goodbye to my parents. Especially since our relationship has finally become one of empathy, harmony and love. The many disputes that used to leave me with a horrible, sinking feeling in the pit of my stomach as a teenager, have all but disappeared. My parents are real humans. Their story is one of incredible love and loyalty. Even though they are a lot further along down the road to self-discovery and realization than I can ever imagine being, they still strive everyday to love each other more fully, to love the whole world, and to be as alive and happy as possible. The silver lining in their departure is the fact that I am easing into the long awaited summer, and a long awaited vacation. The city is in full bloom, and all its people are lingering outside to soak up the warm air for as long as possible. All I want to eat are summer fruits and veggies. Luckily, I don’t seem to be the only one who feels that way, and the farmer’s markets and supermarkets are beginning to oblige. 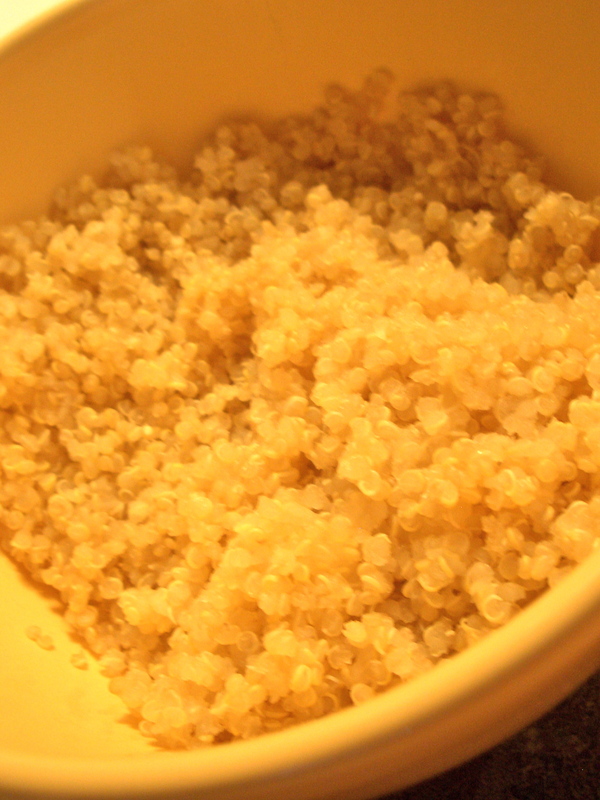 Put the quinoa in a saucepan with the stock and bring to a boil. Once it begins to boil turn the heat down and cover, letting it simmer for about 15 minutes. 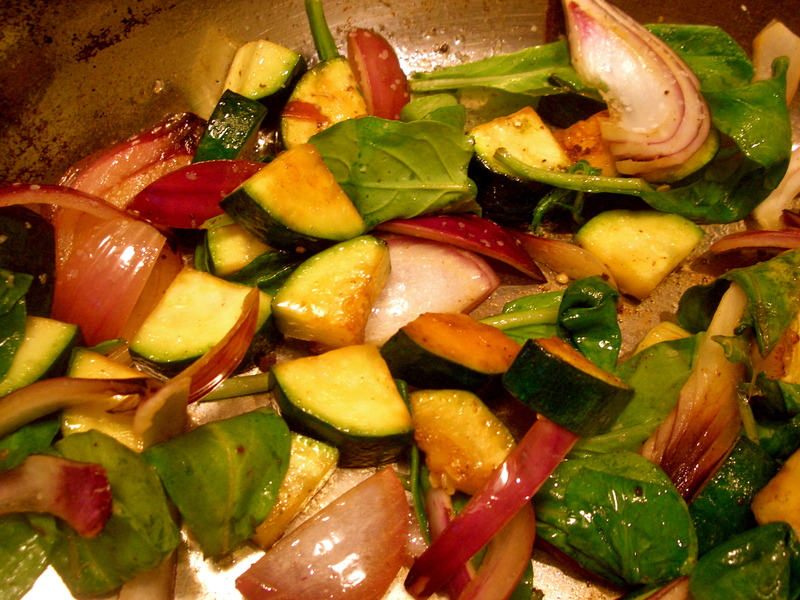 In the meantime, Chop the zucchini and place it in a hot skillet with one tablespoon of extra virgin olive oil. Salt and pepper to taste and sauté for about ten minutes. 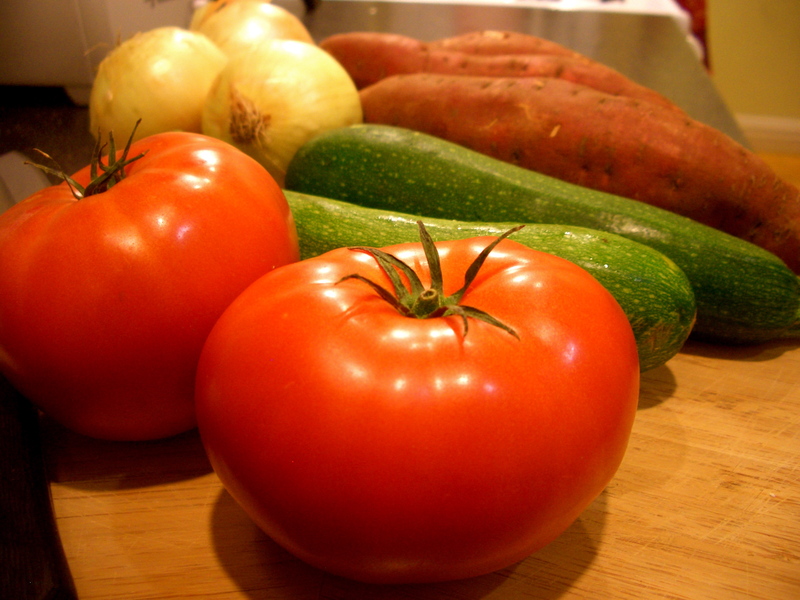 While the zucchini is cooking, chop up the onion and tomato. Add the onion to the pan and continue to cook for about five minutes. Finally, add the baby arugula and continue cooking just until it begins to wilt. 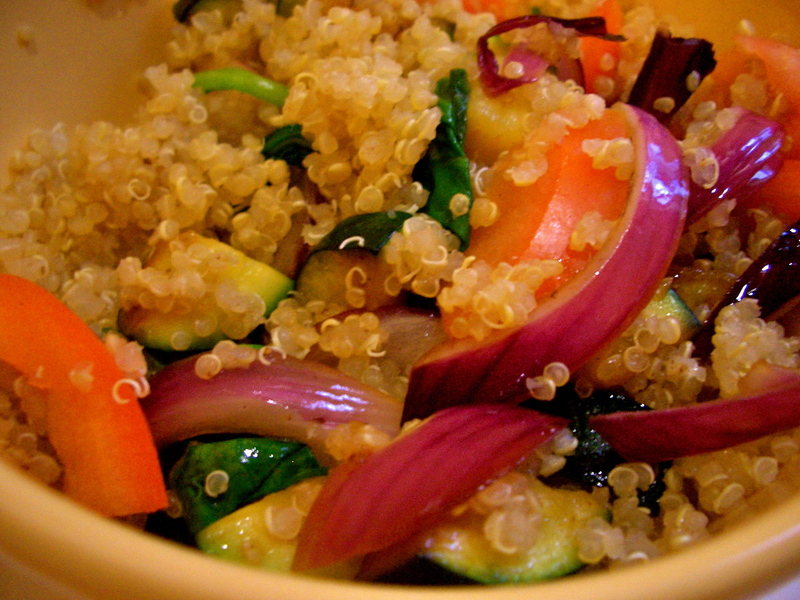 Combine the quinoa, sauteed vegetables and tomatoes, and drizzle the remaining olive oil over them and add a bit more salt and pepper to taste. Looks and tastes like summer to me! Oh man. My weekend spell of acute optimism seems to be fading, and a severe case of apathy is taking its place. The only thing I did deliberately today, was avoid obligations. Hypocrite I am… My obvious solution to dealing with the little lines I keep having to add to the to-do stickies cluttering my computer screen, is to cancel my entire day and watch television on the internet instead. That seems logical, right? 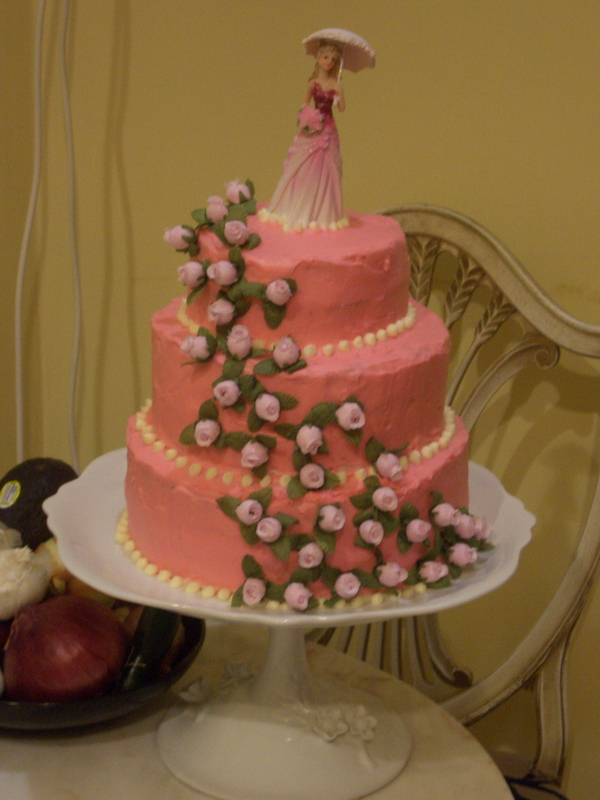 The only cure for listlessness of this severity is cake for dinner. Luckily I have some sweet lime cake to brighten my spirits. 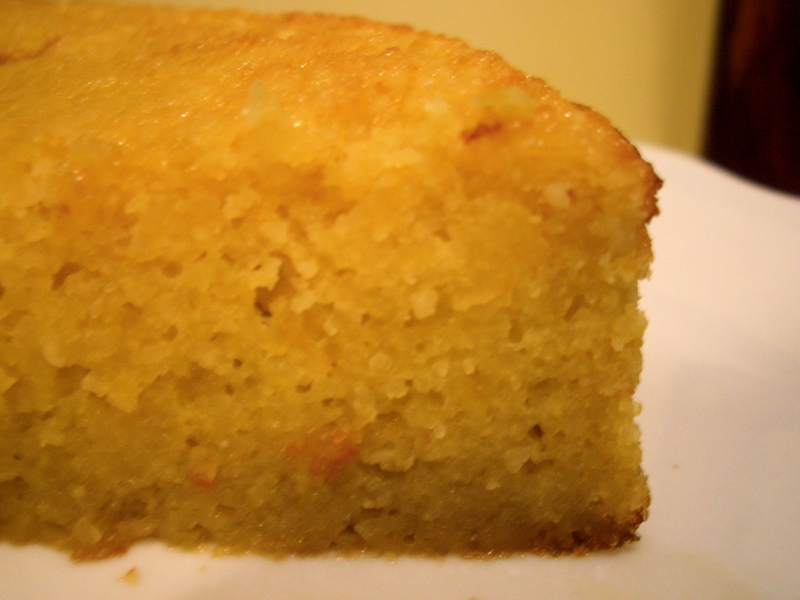 I adapted the recipe from Nigella Lawson’s Clementine Cake recipe, which is one of my all time favorites. still have some of those candied kumquats? good. Put the sweet limes in a pot and fill it with cold water (to cover). Put the pot on the stove and bring to a boil. Boil the sweet limes for two hours then remove them from the pot and set aside to let cool. Preheat the oven to 375 degrees. 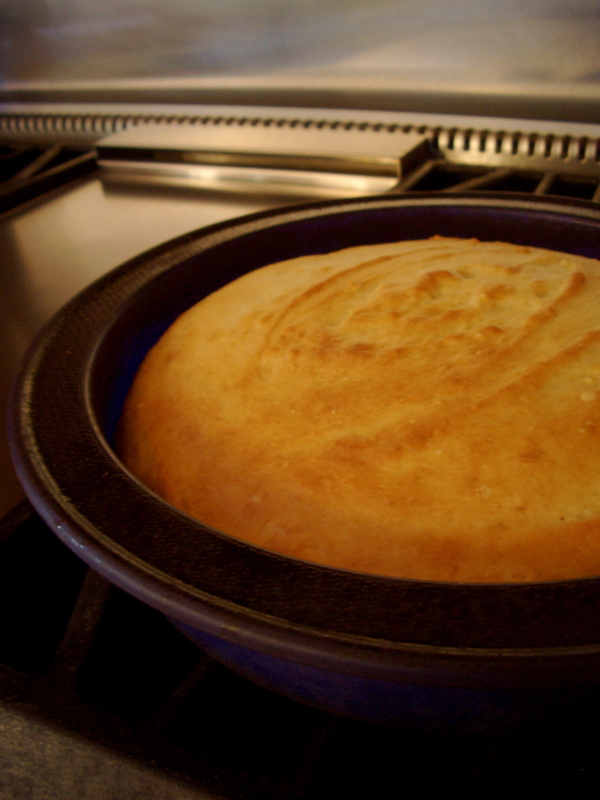 Grease and line a 8 inch round cake pan (springform if you have it) with parchment paper. Cut the cooled sweet limes into quarters and remove any seeds. Puree the limes in a food processor (including the rind). Beat the eggs in a separate bowl and add the sugar, almonds and baking powder. Sir to combine and add the pureed limes to the mixture. Pour the cake mix into the prepared pan and bake for about 30 minutes or until a toothpick inserted into the center comes out clean. 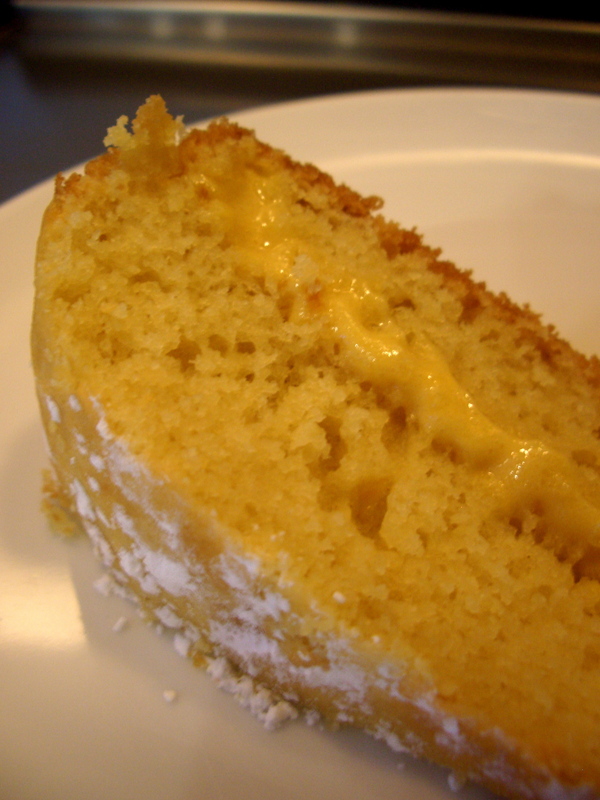 This is one of those cakes that is really good the first day, and MAGICAL the next day. Something about giving it a day to sit makes the flavors pop a bit more. 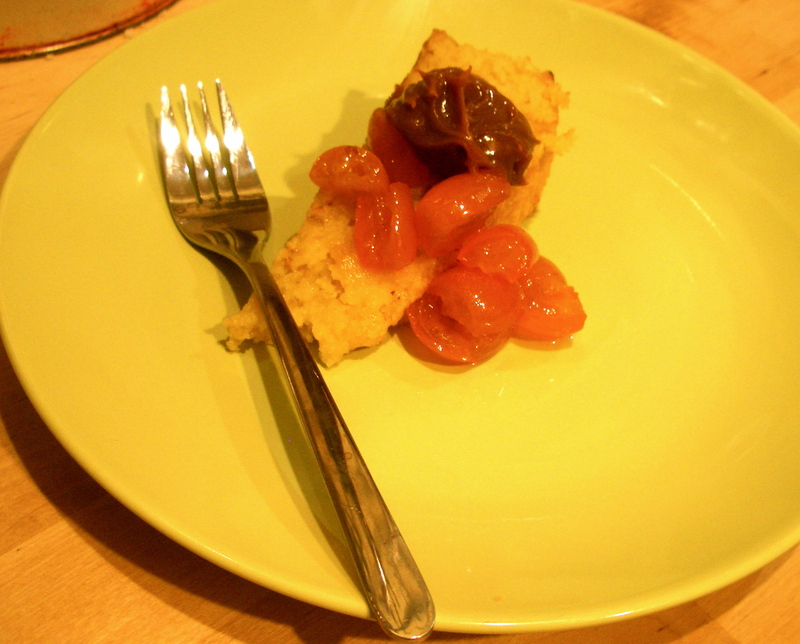 It’s especially good if you top it off with a bit of dulce de leche… and some candied kumquats. Oh heavens… I can’t talk about it anymore… I’m getting drool on the computer. Fight the listless blues! Eat cake! It’s becoming that time of the year. People are becoming exceedingly busy, and exceedingly uninterested in being busy. The weather is giving us an enticing taste of what’s to come. Obligations and pesky errands are reminding us that warm sunshine doesn’t make us exempt from the little mountains we have to climb every day. I keep finding myself rushing to finish the less exciting parts of my day as quickly as possible to enjoy some of the loveliness that spring brings. I think part of the problem with being young, inexperienced and a general mess, lies in a complete lack of deliberateness in everyday actions/tasks. Somehow I missed the memo demonstrating the vast difference between doing something deliberately and wholly, and plowing through something carelessly. This week I decided to take my newly unearthed idea of deliberateness for a spin. Wow. Even the small amount of time it took to be conscious of it changed everything. Not only did the annoying parts of my days seem less… well… annoying, but I found bits of myself in the work that I did (instead of the muddled chaos I usually leave in my wake). This could be the dawning of a whole new era of un-muddled chaos! 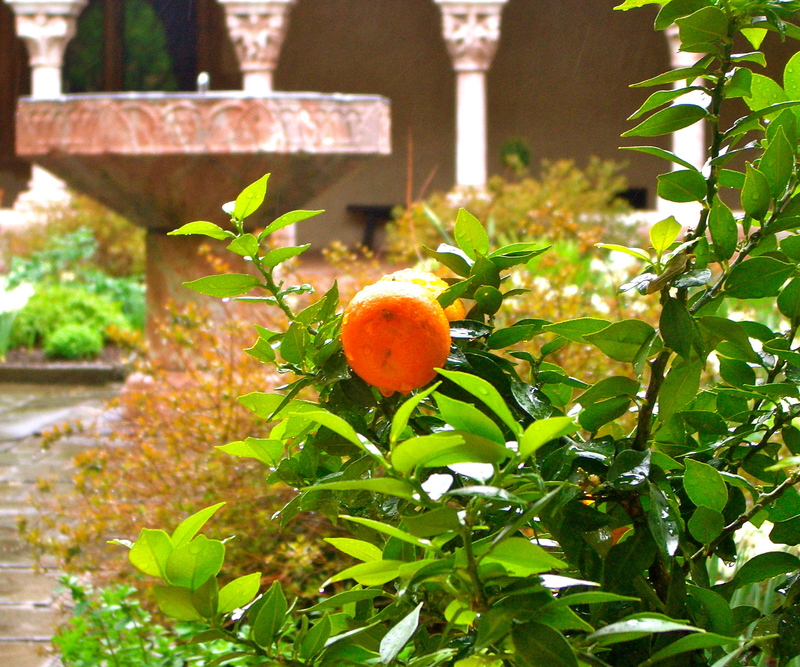 Oh, the little delicate kumquat…. so juicy and packed with a bitter punch on the inside. I used to only know what they were in the context of my mother’s favorite saying: te voy a romper el quinotito… she would say to me. (I’m gonna break your little kumquat… by which I’m assuming she meant head? weird.) 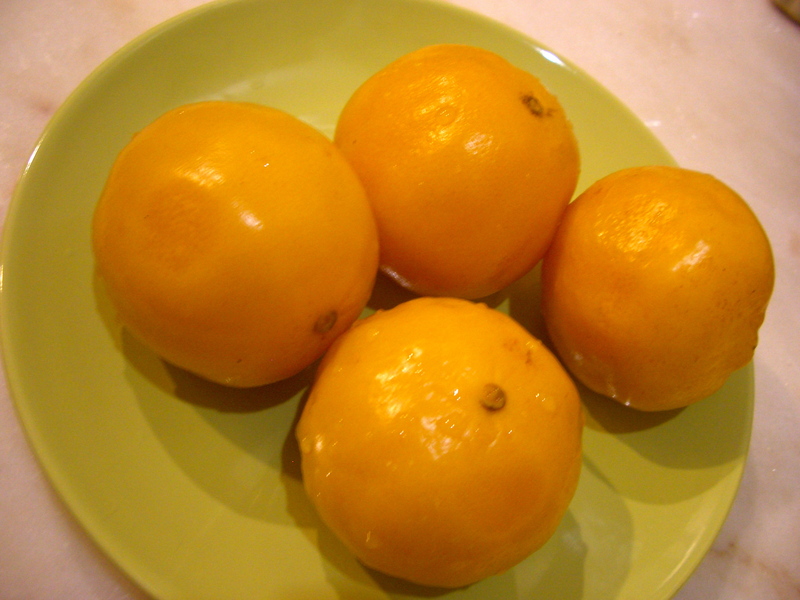 Anyway, I didn’t realize that it was an actual fruit until someone snuck a raw one on my plate a couple years ago. Even now I think they taste strange raw… It’s almost like that one kind of food you don’t really like, but for some reason you keep eating. In any case, we’re not here to talk about raw kumquats. We want CANDIED kumquats. Why? Because they are succulent. 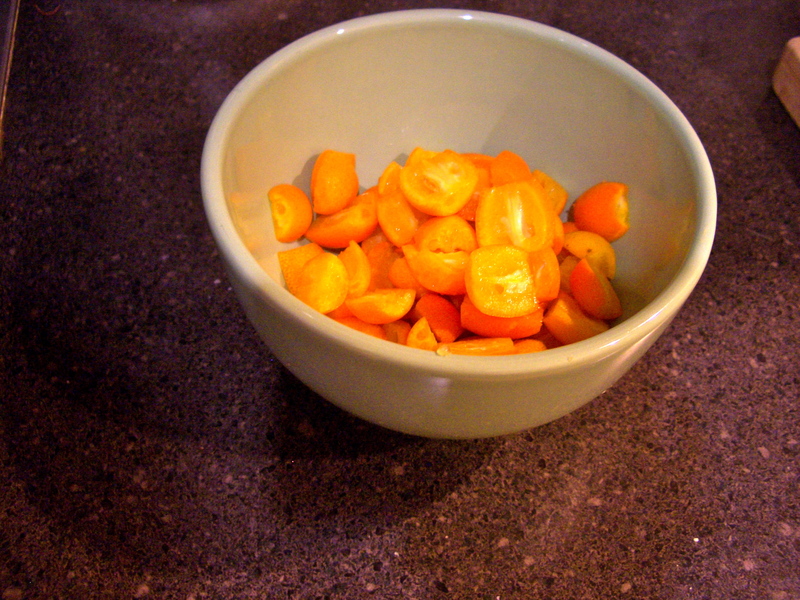 The perfect recipe for candying kumquats (or any fruit, for that matter) can be found in Tartine. Tartine is from the famous San Francisco bakery with the same name, which has flawless recipes for non gluten-free baked goods, and a few celiac friendly ones. 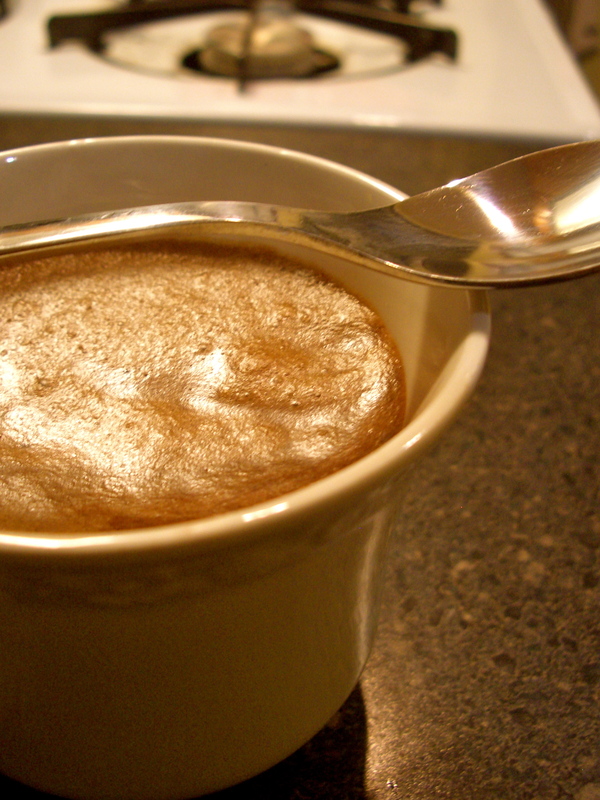 In a medium saucepan, combine the sugar and water over medium heat, until sugar dissolves. Add the fruit and reduce the heat to low (If you want to be extra fancy throw a few cinnamon sticks in the mix). Let simmer for approximately 20 minutes. Remove from heat and place in a heatproof container to cool. 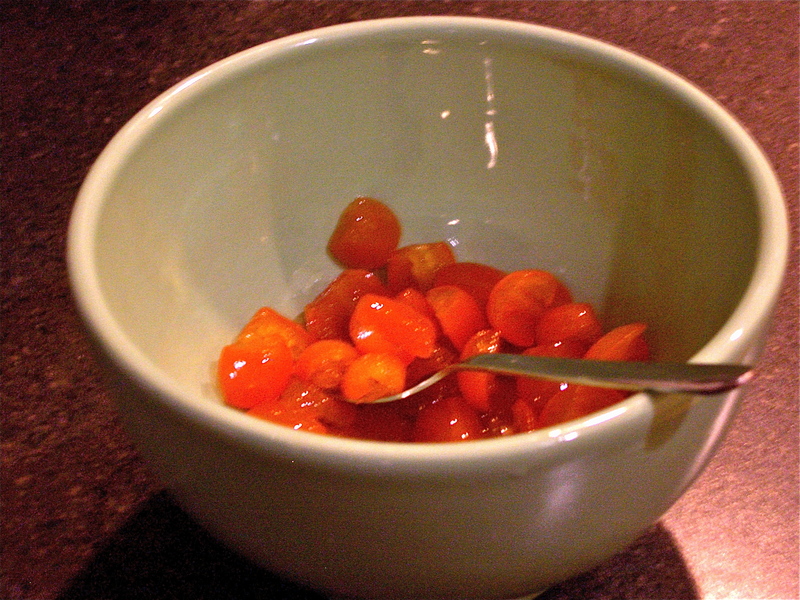 Store the fruit with its syrup in an airtight container in the refrigerator. And they’re little jewels of perfection. Oh! And don’t forget to save the syrup they’re in! Use it to sweeten yoghurt! Use it to make a cocktail! yum yum. Sign Jamie Oliver's food revolution petition!